We left our spot next to Lubenham Lodge and chugged off quite early as we knew it was going to get a bit Scorchio!! Twenty-four degrees again. 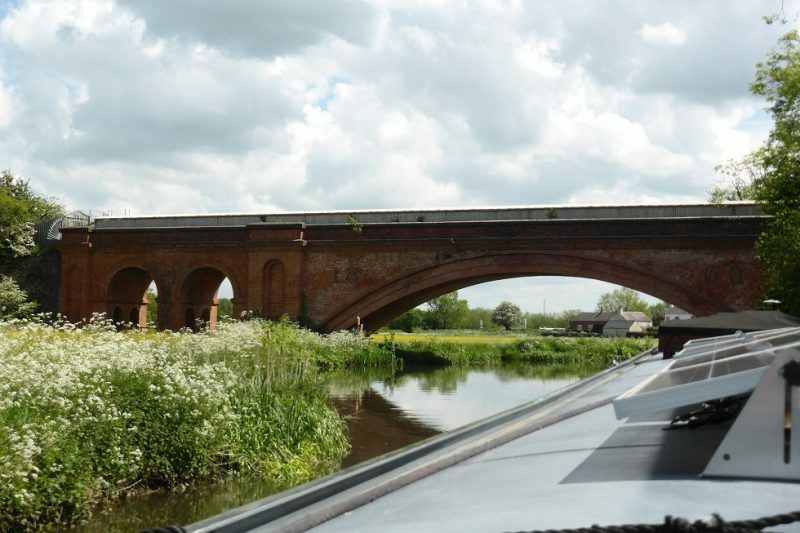 We left soon after eight and chugged the very pleasant two hours to Welford junction. The quayside here is very low and so you get down to do de painting! 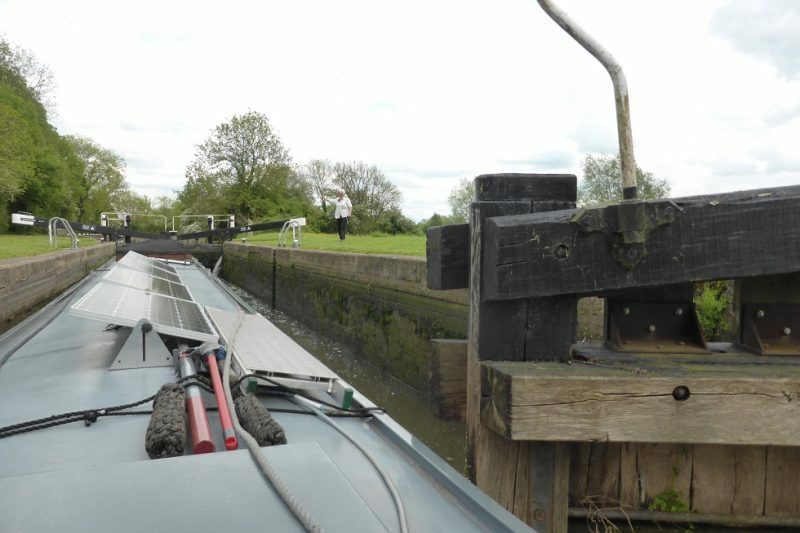 We had a few lock rashes, well, we have travelled 223.5 miles and been through (and sometimes scraped thru) 121 locks! 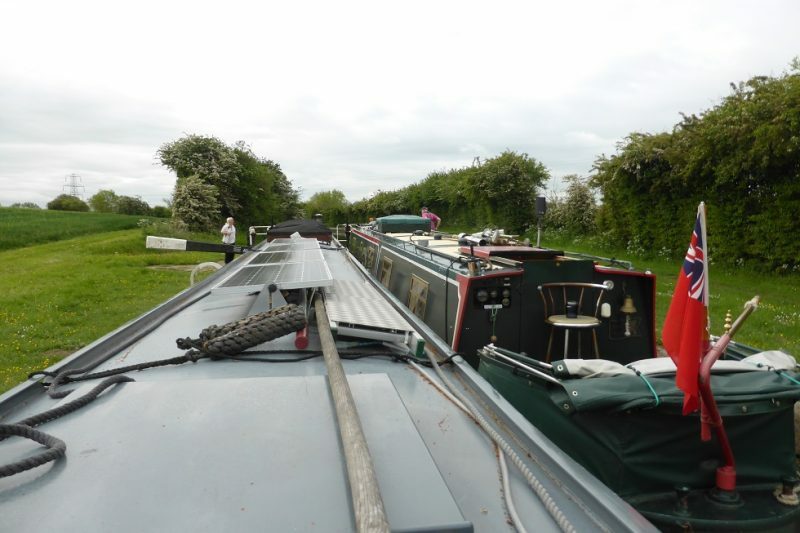 I reversed round Welford junction to a suitable mooring – painted one side – drove up to the junction, 3-point turn back to the mooring – painted t’other side. Meanwhile Viv cleaned the solar panels and polished me mushrooms. Final resting place for today – back to the marina tomorrow. Around the Ring in 50 days? Does it really feel like we’ve been out 50 days? Don’t know. Why stop? Well, Crick show is one small reason plus a bit of R&R as we’re a bit cream crackered – it didn’t seem this difficult 2 years ago! Mind you having seen Beryl on Wasp – one of the original boat girls, she was on the Limehouse run, apparently (no idea – answers in the comments below?? ), we must be 20 or 30 years her junior, so we can’t complain, much! 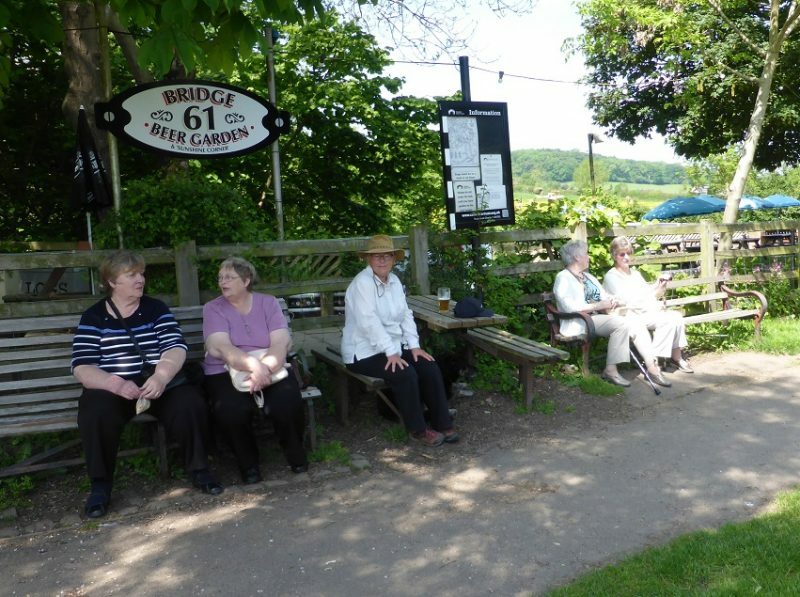 Nearly five hours today but it was also a wait for Foxton locks. 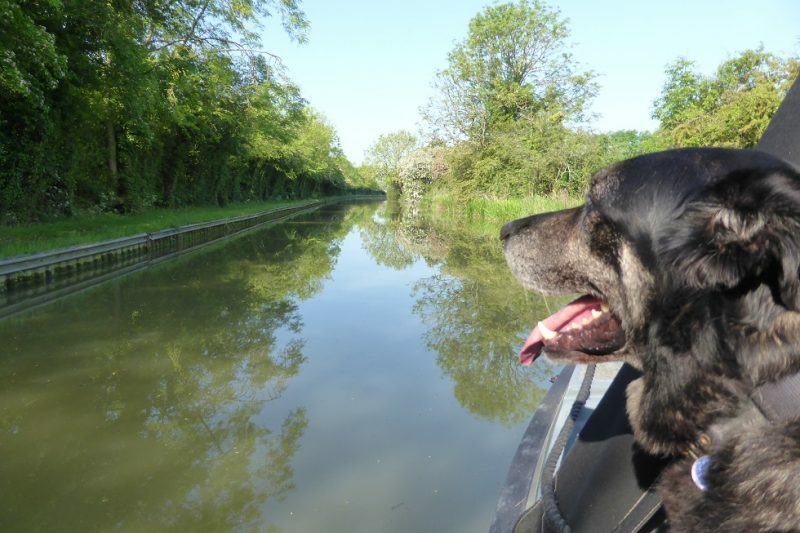 It was really hot – hottest day of the year so far – 26 degrees in the boat! Viv drove the boat up and I slogged thru the gear going uphill – I had help from a chap (Ade) from the boat coming up behind us (Serendipity), which was nice. 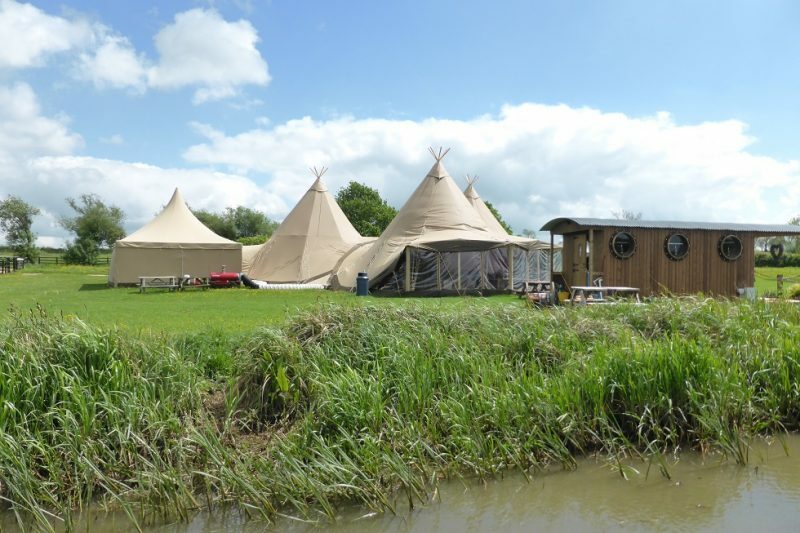 So, got to Lubenham, one of our local favourite spots, just a few minutes up from Foxton. 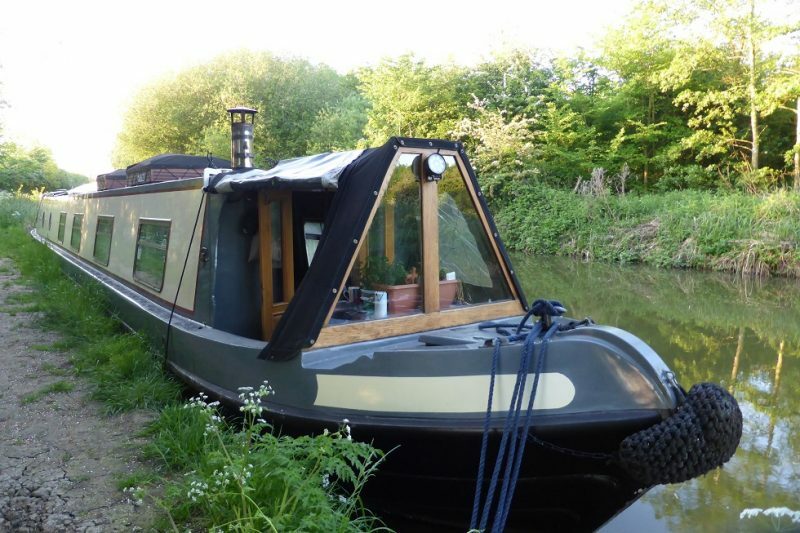 Nice views and an easy mooring. No, Viv’s not saluting, just the very bright and hot day – upgraded from 22 to 24 degrees. 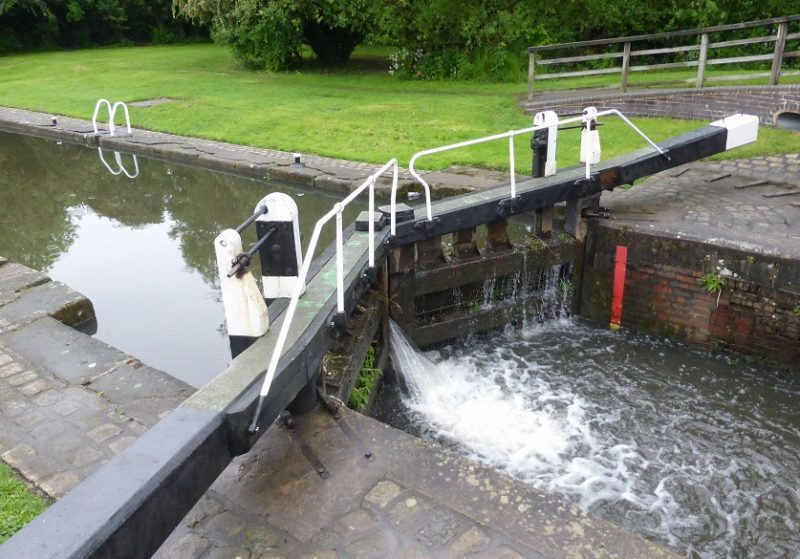 Viv drove up the 10 locks, whilst me & Ade wound the paddles and shifted the gates. Soon at the top -some 75 feet higher up now! Ten minutes later – all stop, finished with engines . . . Lubenham. Shuffled up to get a better view. View from . . . that’s enough for one day. Welford junction tomorrow. Time for some Boodles gin – pinkers all round. After the two days in Leicester, we moved off on Sunday morning. Hmm, not a good time as the rowing club was out in force! Still they stuck to one side of the mile straight and we went down the other. 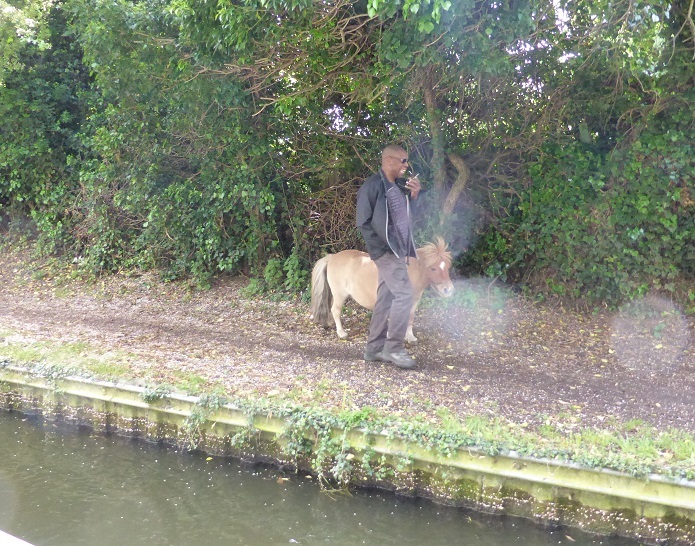 We got to the end of the river bit at King’s Lock (some four locks and 2 hrs later) and picked up Ian on Swansong, who serendipitously chose to cast off at that time – jolly good, someone to share the locks with. Onwards to Kilby Bridge. 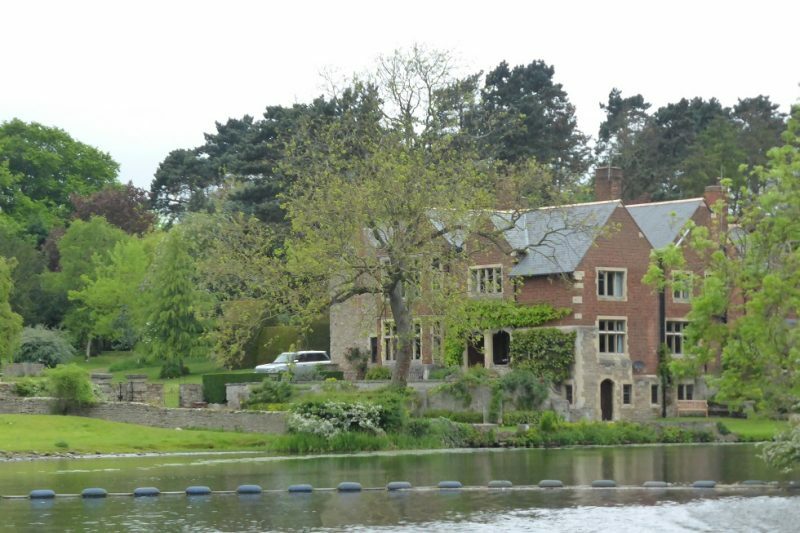 Here’s a view of the splendid new moorings at Friar’s Mill – from the road side. 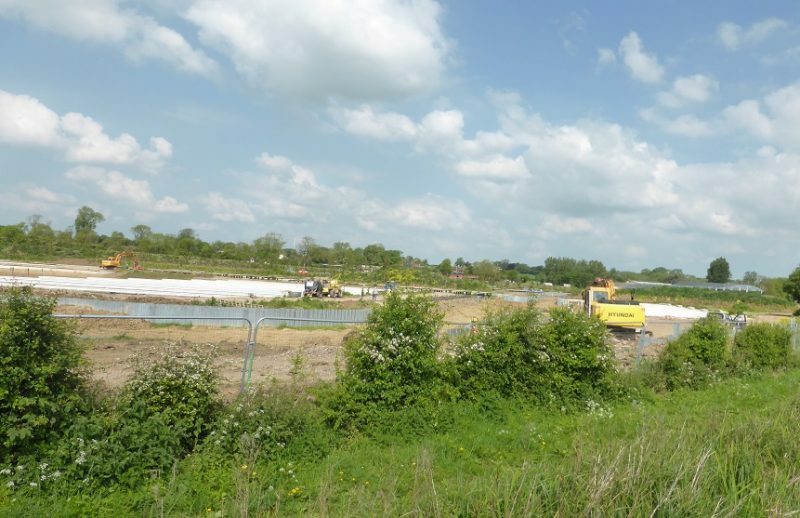 Note to our Leave friends – another EU paid for project! A man taking his horse for a walk, as you do . 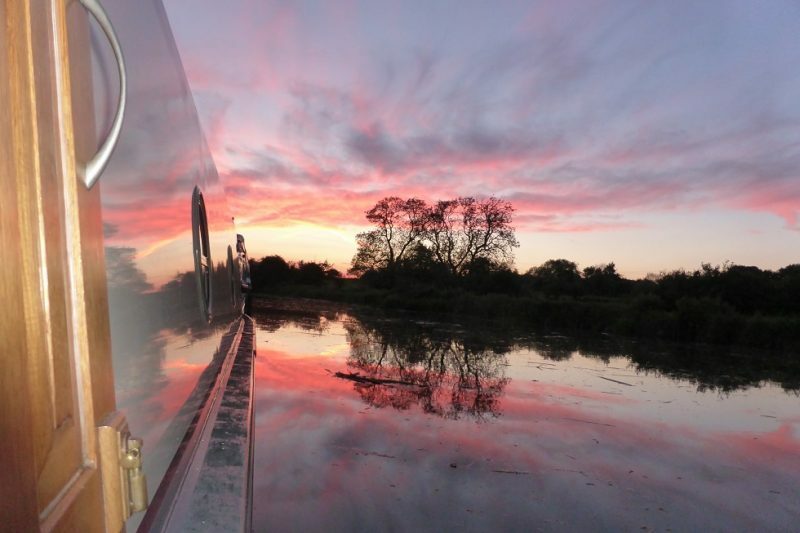 . .
A long day but a gorgeous sunset – highlighted by the super polishing work! 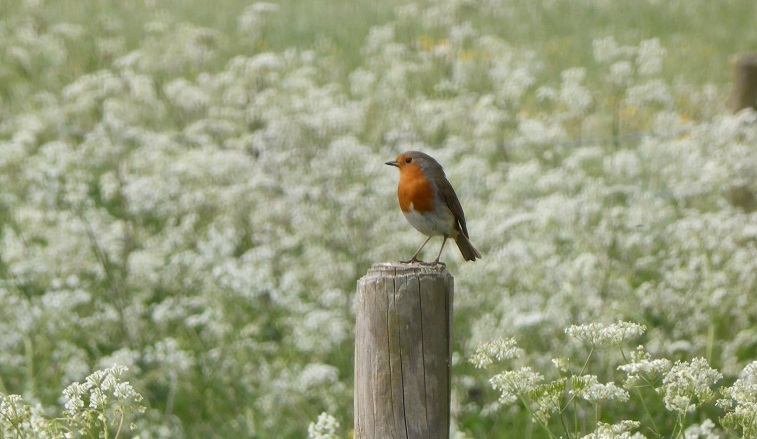 We were impressed by the birdsong here – especially the songthrush. They usually chant “RayMears, RayMears” but Steve was sure this one was saying “Wnker, Wnker” – listen after 1:30? Or is it just Steve?? Anyway, it’s great just to sit and listen to the birds. 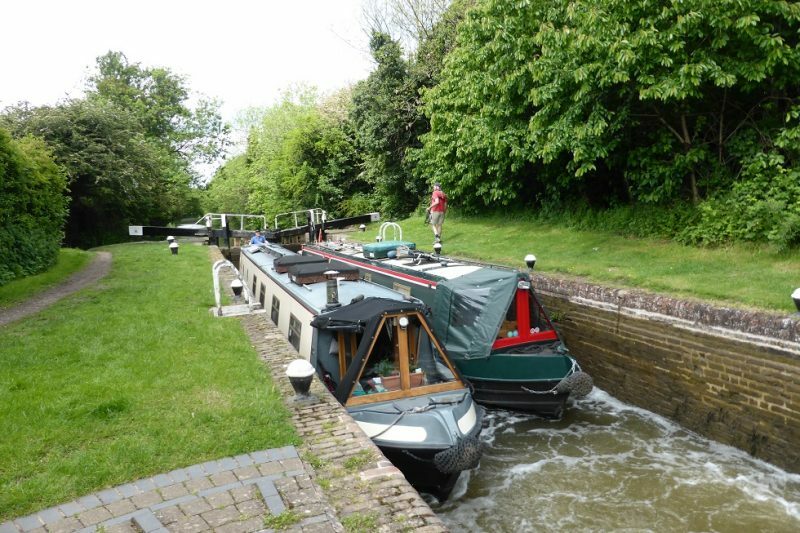 We stayed another day for rest & recuperation, then onwards – the final 12 locks to Fleckney. 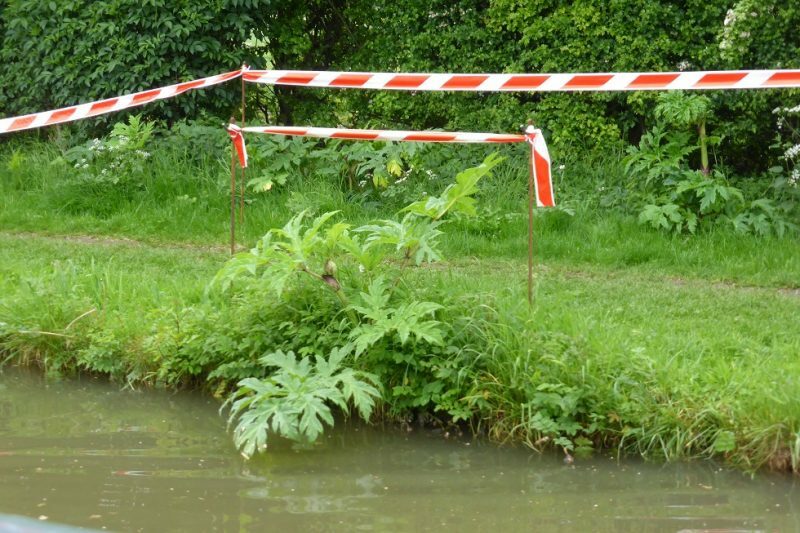 We discovered that the cordoned off areas were because of giant hogweed – there were lots more of it along the towpath, nasty stuff! 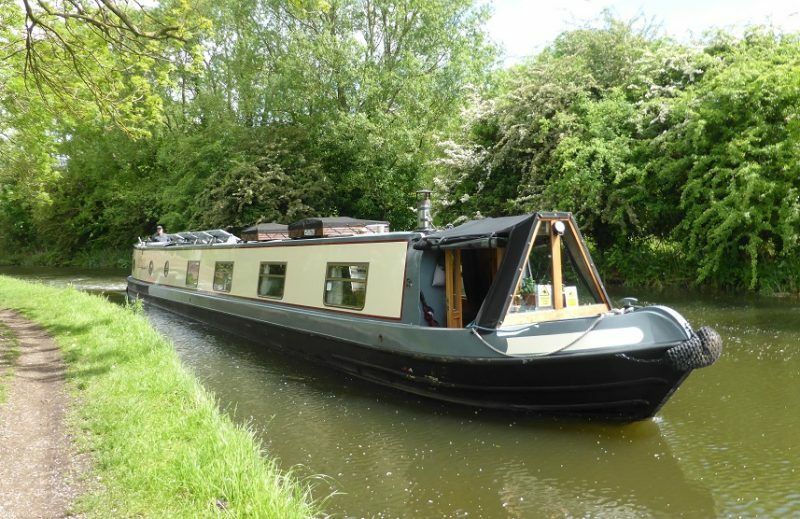 Ian’s a continuous cruiser – been doing it for 5 years – a very calm and considerate chap. He stopped for the day at Newton Harcourt. It was a pleasure to cruise with you Sir! 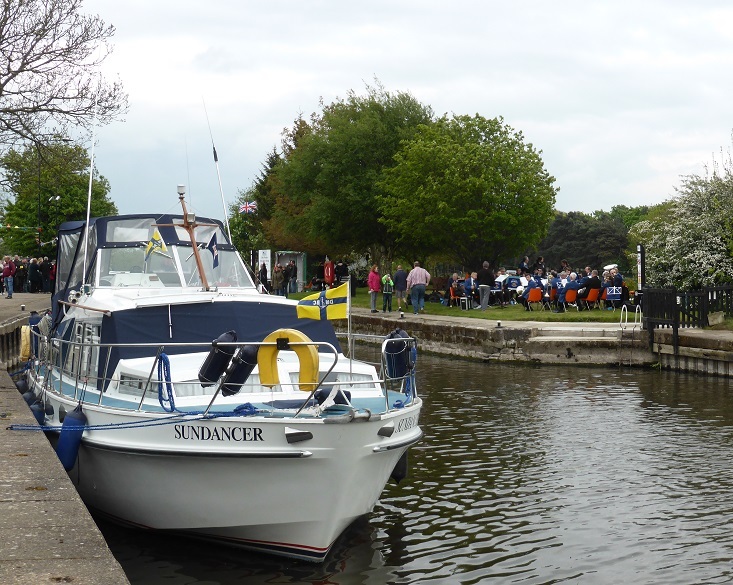 At Crane’s Lock, another boat, Symphony, had very considerately waited for us and we continued our lucky day in sharing the next five locks. There seemed to be plenty of water about – 2 years ago we went aground in some of these pounds. 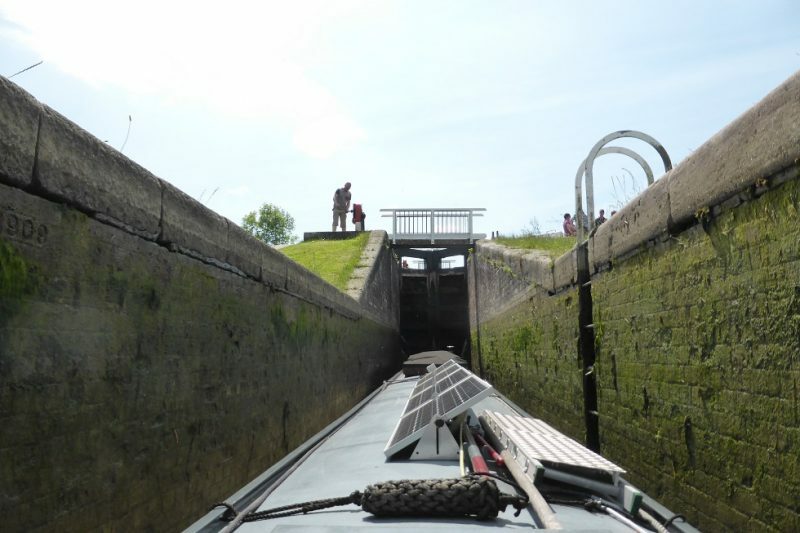 Sharing does help – it keeps the boats steady and extra hands on these heavy gates is a boon. And finally, we stopped! 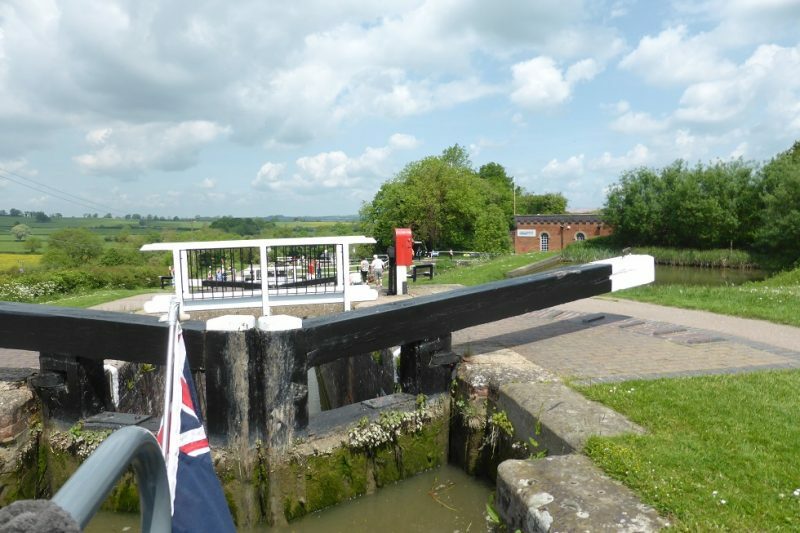 Only 5.5 miles but 12 locks but it did take us 5 hours. Phew. 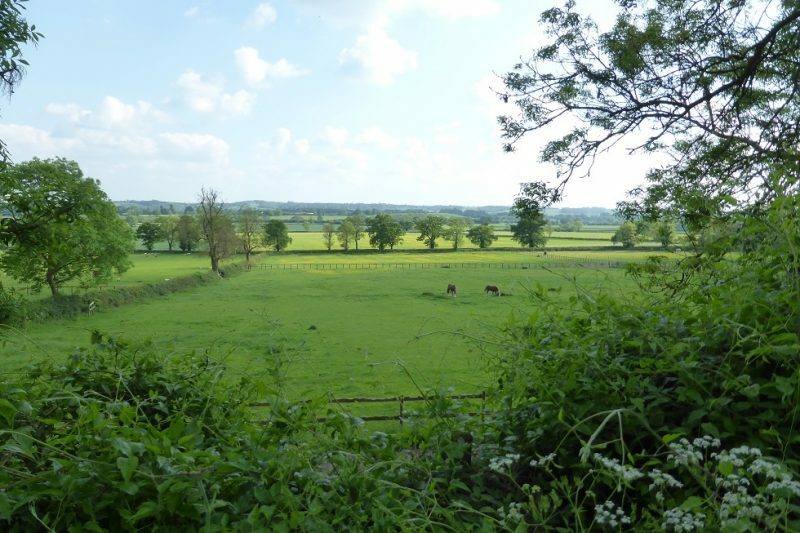 We walked across the field into the charming village of Fleckney, had a pint in the charming pub, the Golden Shield, shopped in the Co-op and tucked in to Tandoori Chicken kebab & chips from the, erm, charming village chippy. Back on the boat for a pipe & some Aberlour peaty malt whisky. Only 8 o’clock but is it time for bed yet?? 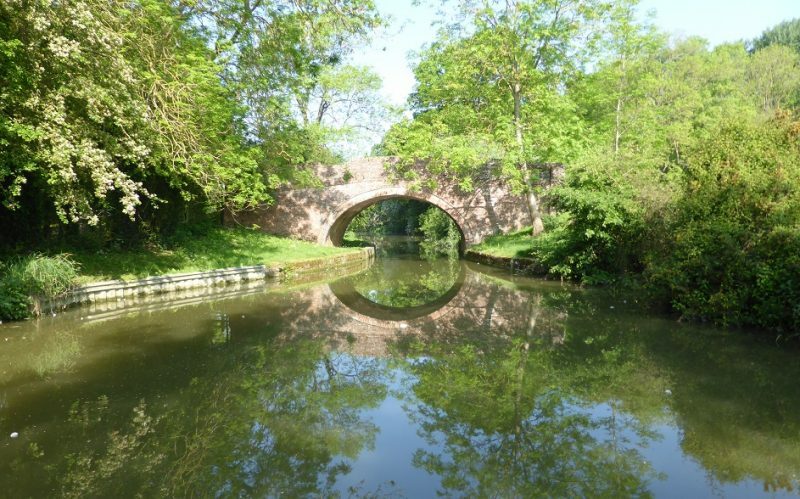 It must be age cos we’ve done this journey before, years before on a hire boat and then two years ago when we had the solar panels fitted, but then it was all calm and serene; the river gauges were off the bottom of the green and it was hot & sunny! It all changes when you get a bit of rain and anxiety begins! 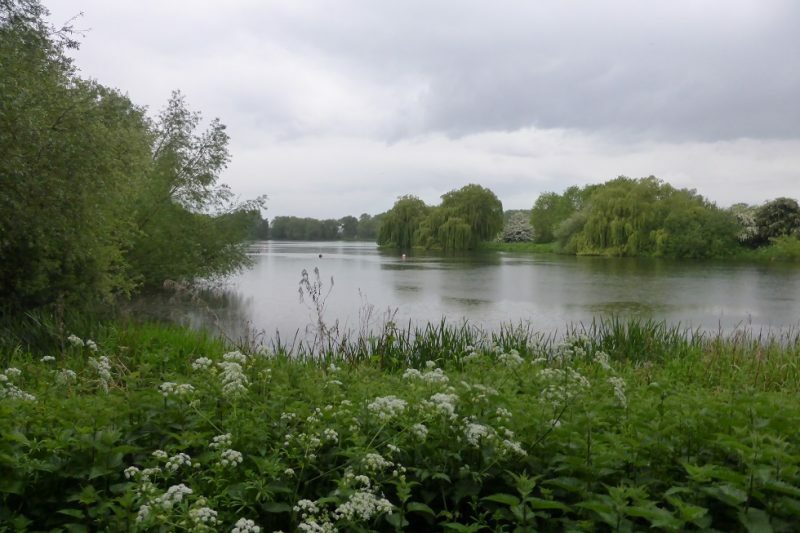 Friday saw us settled at Watermead and it was still drizzling. 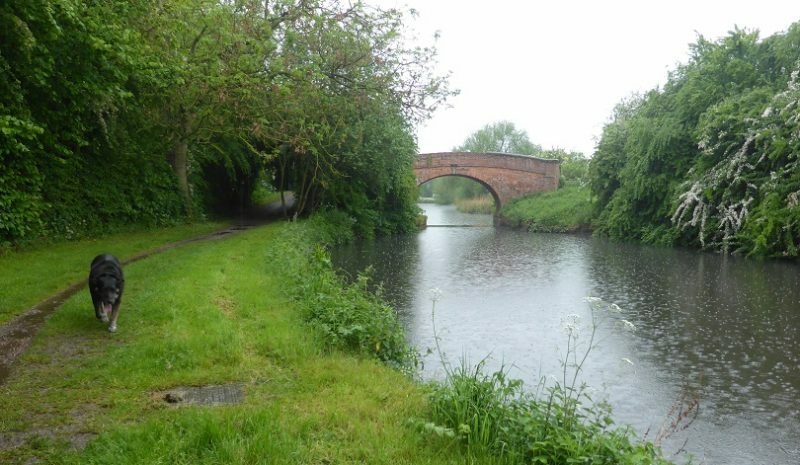 I cycled with my new Bickerton down to the first lock at Thurmaston – all OK. Amber I think. 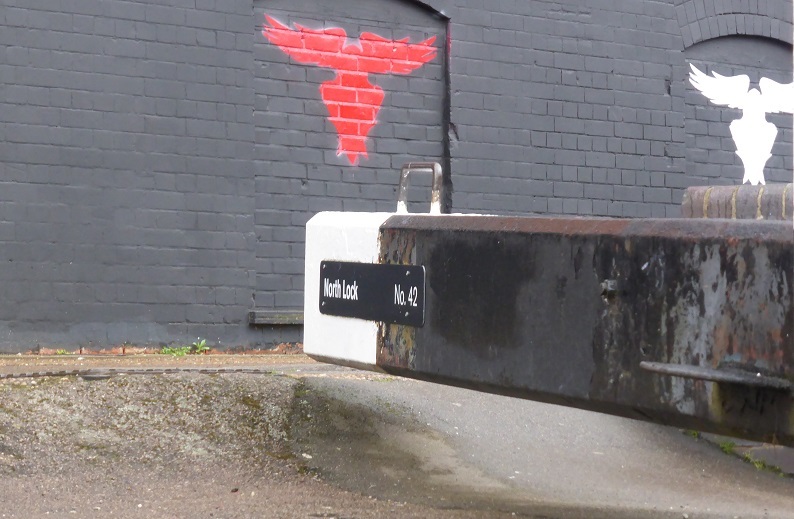 Then on to Birstall – hmm, just on the red but the flow was fairly serene. 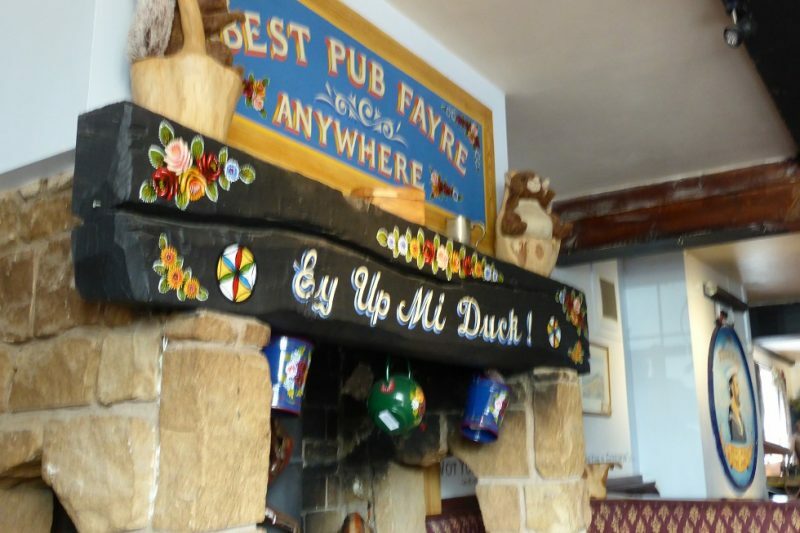 We got a bit downhearted with this drizzle so popped over the road to the Hope & Anchor for lunch – sorry no dogs – so put Toby back on the boat and returned to the pub. Only Abbot as the real ale, hmm, items also not available from the menu. And what we did have was poor to be honest! It looked tired and a bit, well, grubby. So bad move. We skedaddled back to the boat. 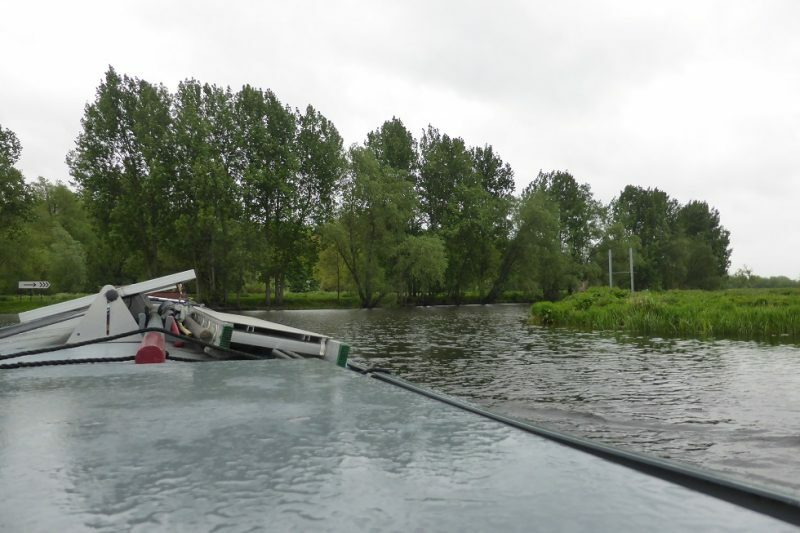 Then a boat went passed us – some Kiwis on a hire boat – they confirmed that all was OK further upstream, so we decided to go. 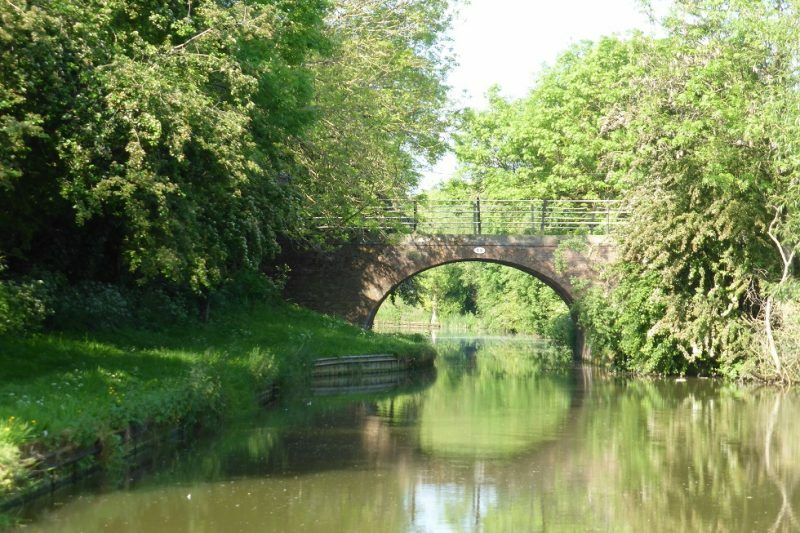 It should take us about 4 hours – we often use http://canalplan.org.uk/ to plan our route as it does give you a good idea of how long a section should take. 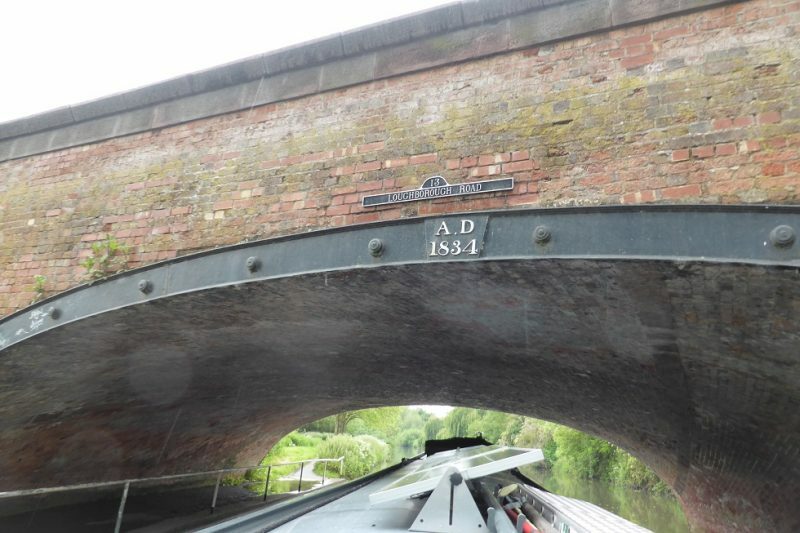 Going upstream with a bit of fresh on (as they say) means you go slower, although our boat did well – Axiom prop and all – steering the twisty, windy river was tricky but we encountered no problems at all and got to Leicester early – six miles and five big locks. We just managed to squeeze in behind Bibendum (Nunc est bibendum = now is the time for drinking! 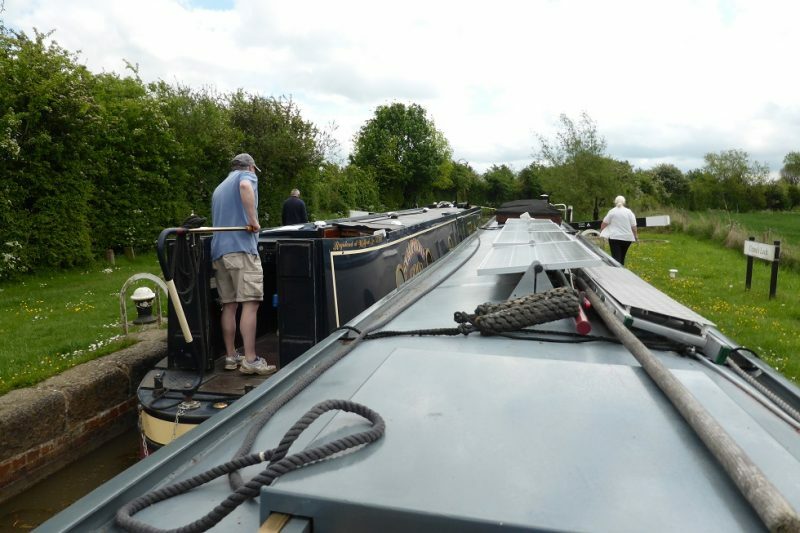 ), fellow boaters from Crick. 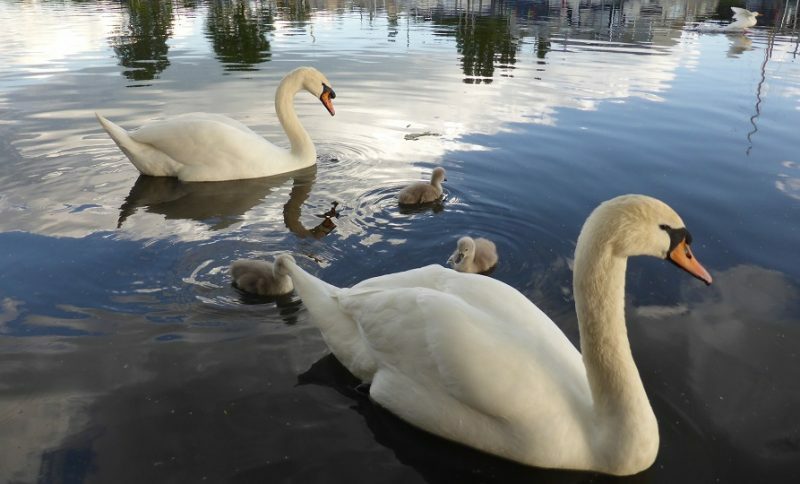 And here’s why it’s dangerous to go sailing on rivers in flood – if you didn’t know the exact course of the river, you could end up in a field, with these swans & geese! 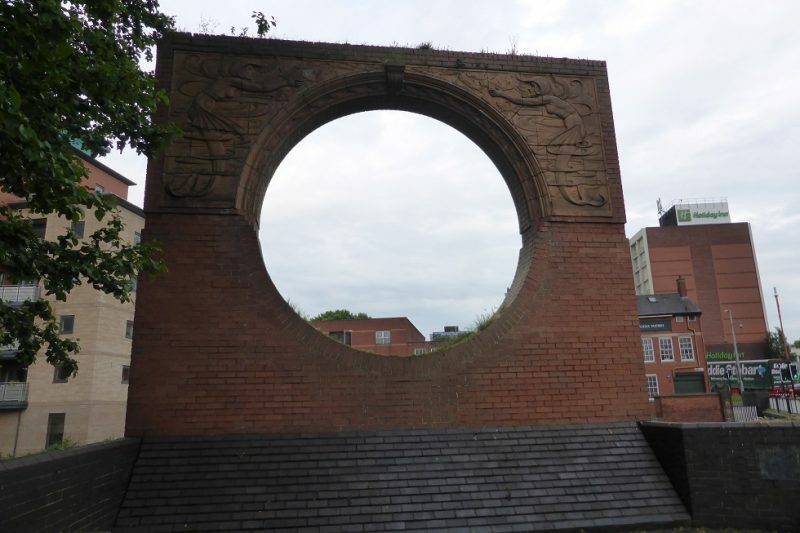 Often tricky to know which arch to head for but the rule is . . . the towpath one and/or the biggest one! 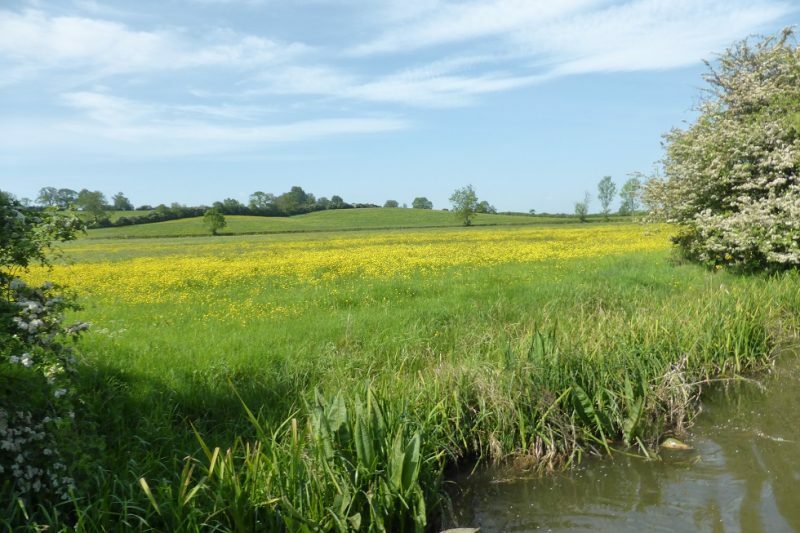 The river gauge here is well into the green, so a sigh of relief from all. 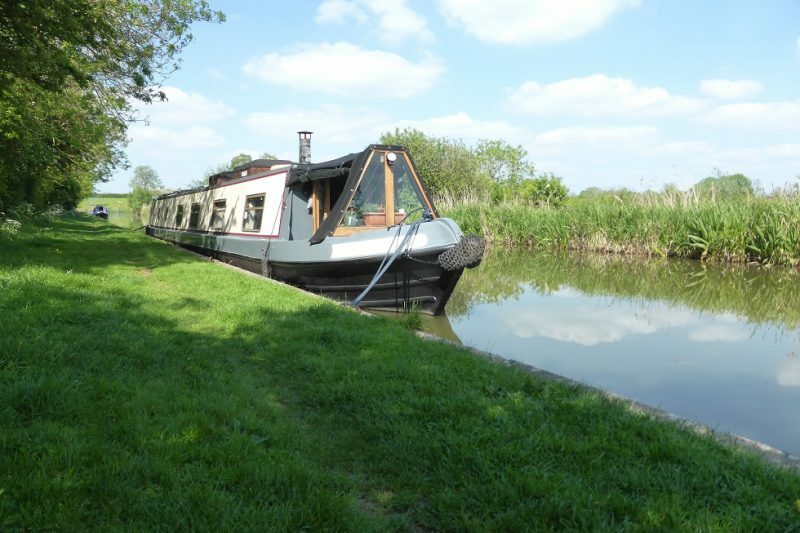 Here’s the new visitor moorings at Friar’s Mill – we are at the end, behind Bibendum, Cumbrian Lass and Swansong. 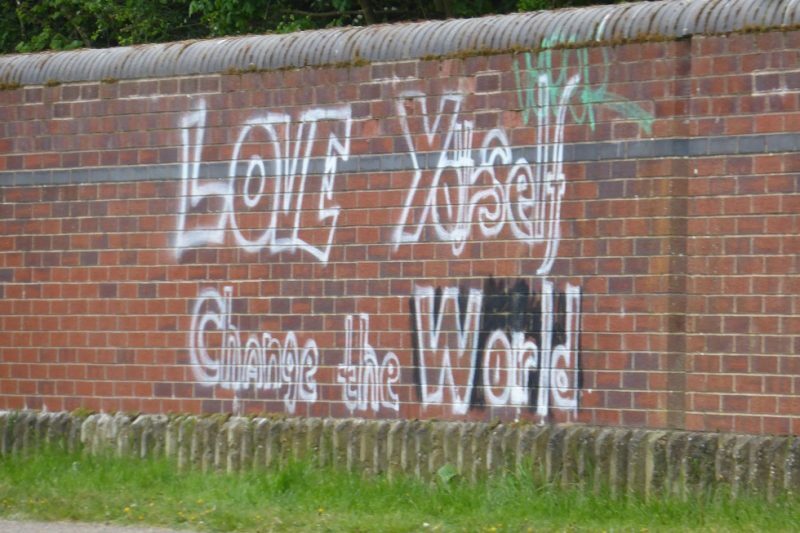 This was a derelict area that has been smartened up. 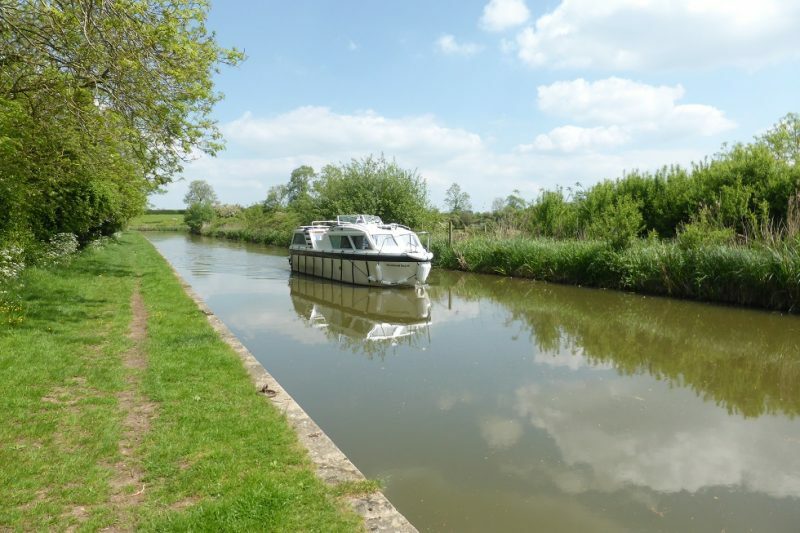 The moorings have water (and eventually electricity) plus a refuse area and a secure padlocked entrance (at night & weekends). 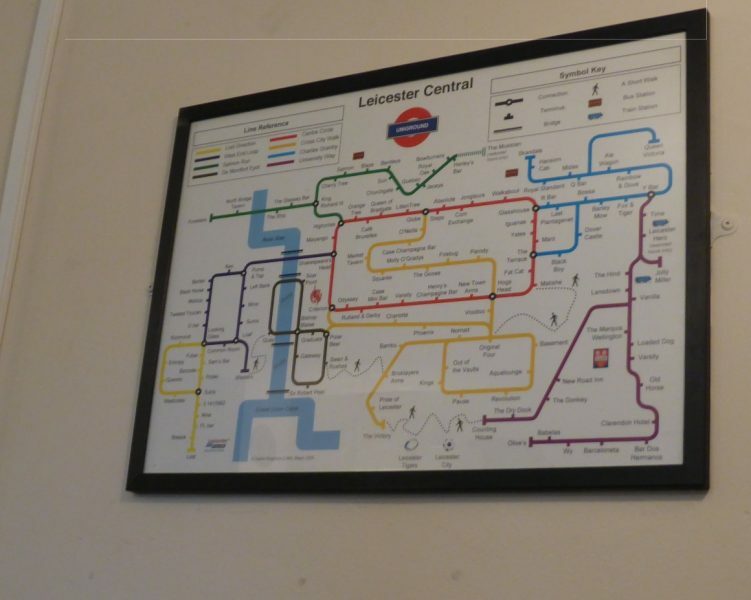 They had an underground type map of all the pubs in Leicester! They wouldn’t let Toby in 2 yrs ago (new carpets) but this time they did! 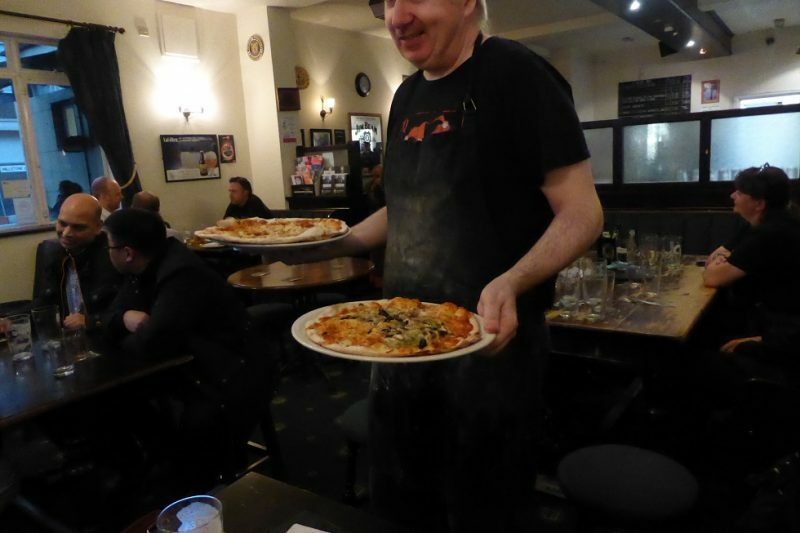 A good range of beers (Spitting Feather’s – RSI and Market Harborough Brewery’s Whirlpool No.2 – excellent) and a food menu of just pizza – all handmade too – brilliant. One Diablo and one Gondolier please! A soggy end to the day but at least we were wet on the inside too! 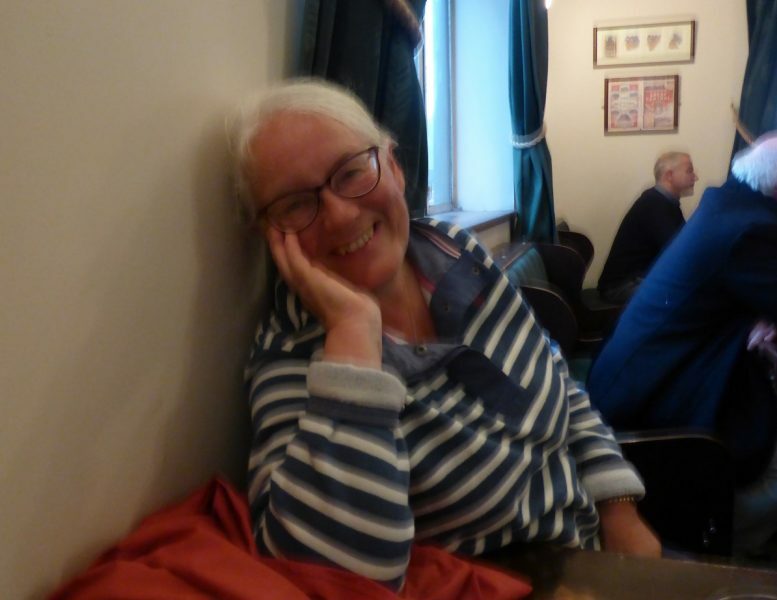 Sorry, a rather fuzzy one of Viv but a happy, smiley face . . . must be the Whirlpool No 2 ! 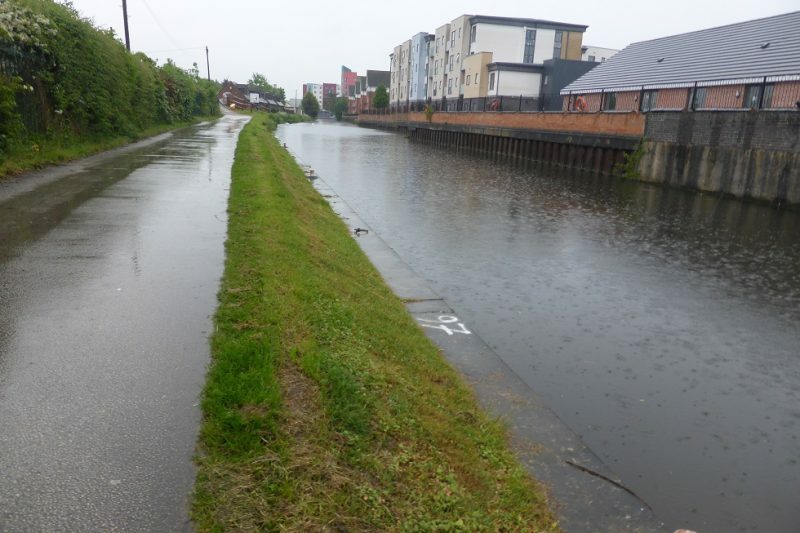 Well, we got the all clear from CRT early in the morning – the Soar was no longer in flood. So we pushed off around eleven. I chatted to some continuous cruisers on a green boat, who were seriously thinking of giving up. 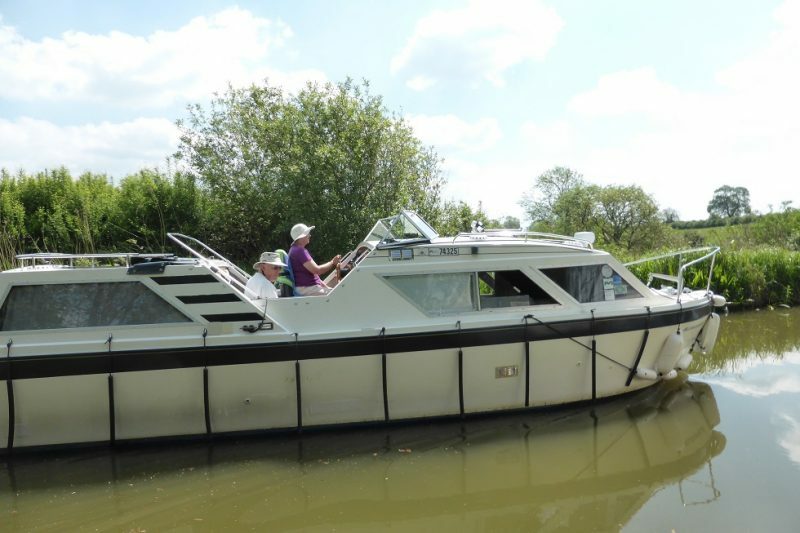 They love the boat, living on the boat and the waterways but had had enough of the “scrotes” on the canals. It was the people they met that left them fed up! I understand what they mean but it’s a shame. 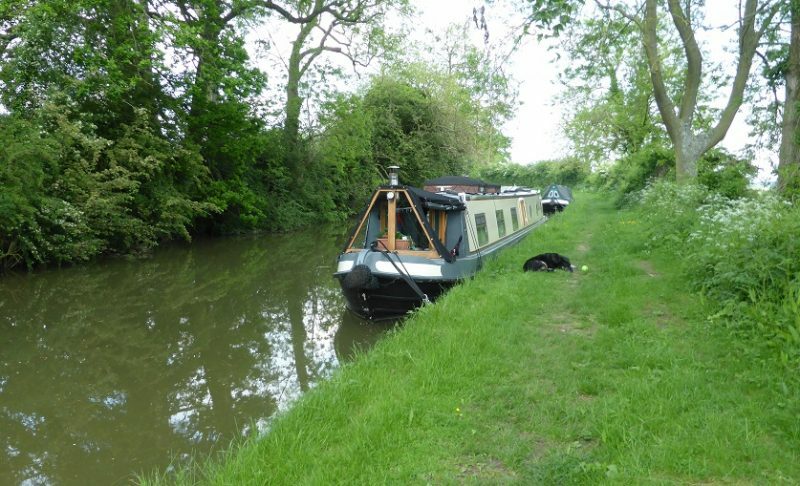 Just after Loughborough, we entered a very serene stretch. 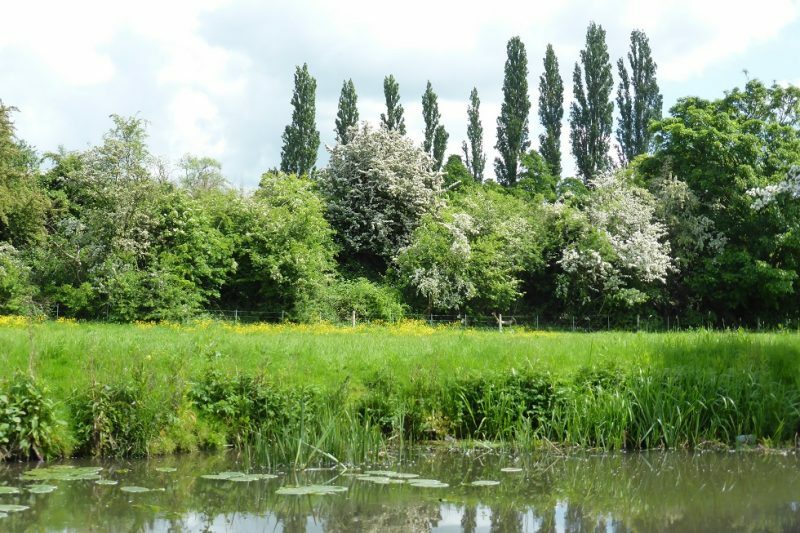 Lots of greenery – well, it did rain a lot! 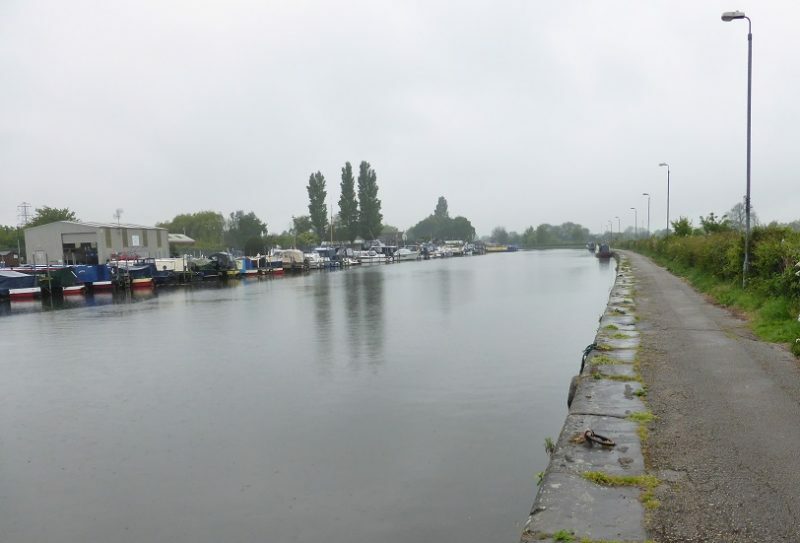 And now for the scary bit – the lock keeper chap at Barrow Deep lock, said we shouldn’t have gone thru the right hand bridge as it’s shallow but not so with all this rain. 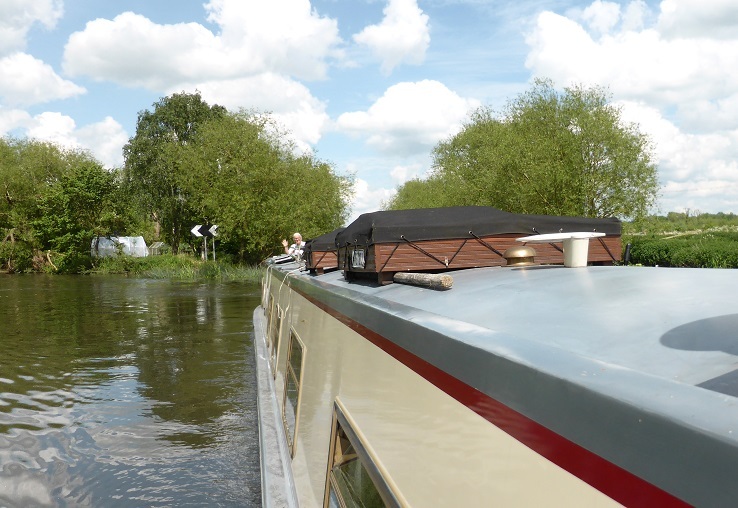 There was a strong flow pushing the boat back and to the left – full revs & that told it what to do. He also said there’s no trouble with the Soar but . 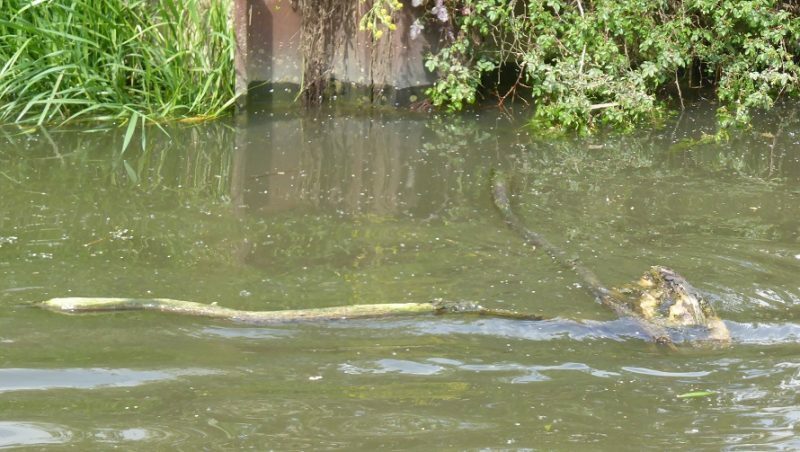 . . the weir at Sileby will push you over . . . here’s the still, showing the strong flow from the weir (it’s always a bit strong, to be honest) but the only way to do this was again, full revs and aim for the lock. Otherwise it would push us onto the concrete bank and we’d be pinned there. Entry to the lock would’ve been a nail screeching crawl along the wall. Not elegant. Coming “downhill” is no problem – again a rapid burst will do, just as long as there’s no waiting boats (esp. plastic ones!!) in your way. Oh, and is this gauge red or amber? Academic really. 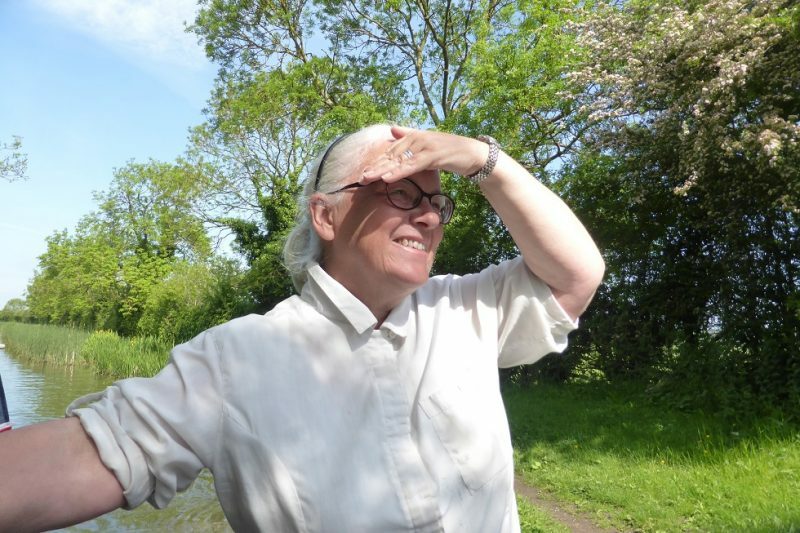 A fine day – in fact it got rather hot! Here’s Viv driving! She did very well and ALL the locks too. 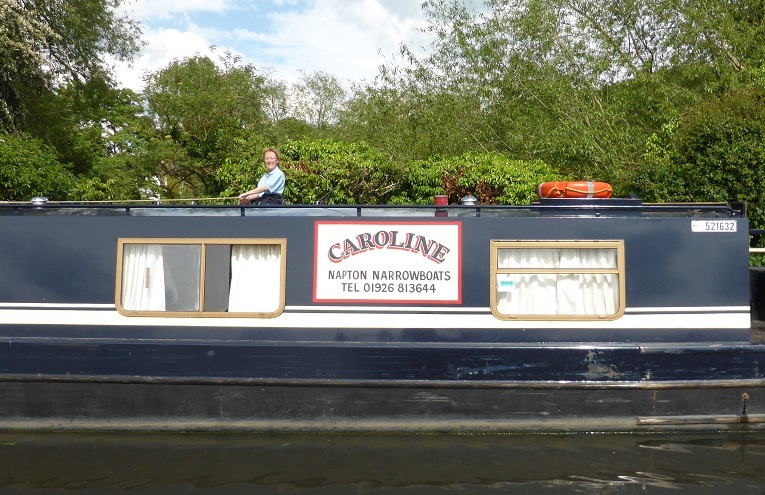 Continuing the scary theme – we met “Caroline”, a Napton hire boat at Cossington lock (hate this one!). They had a very scary experience last night. 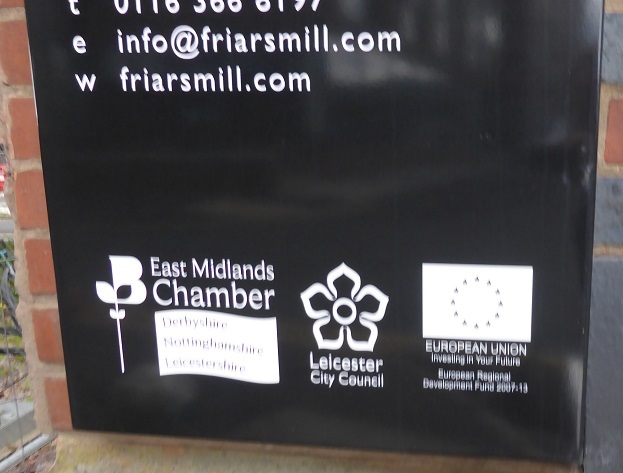 The hire company made them go round the Leicester ring anti-clockwise, to avoid running into the waterways festival in Leicester in June. 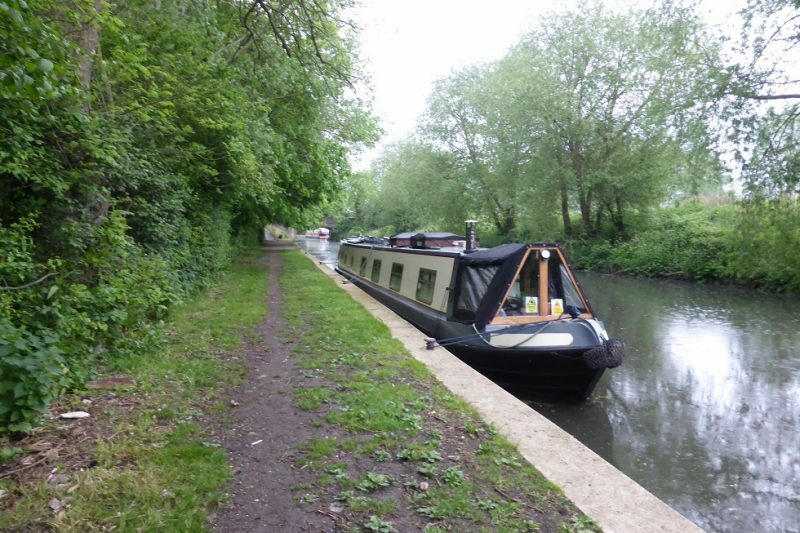 But when they did get to Leicester, all the moorings were 4 deep in boats (maybe holing up because of the expected flood?). So they pressed on. 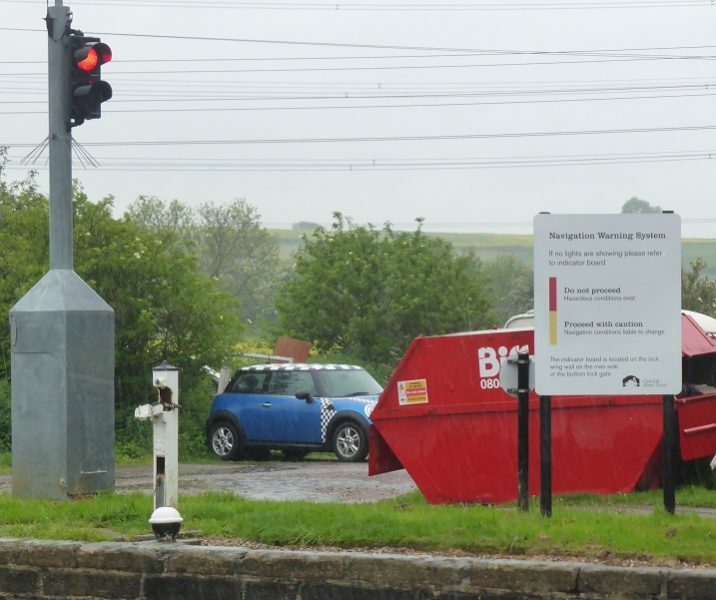 They got to Birstall – they saw the gauge was in the green but in a matter of an hour it had crept up into the red; it had gone up four feet and he’d never been so scared in his life. They were surfing down the river! 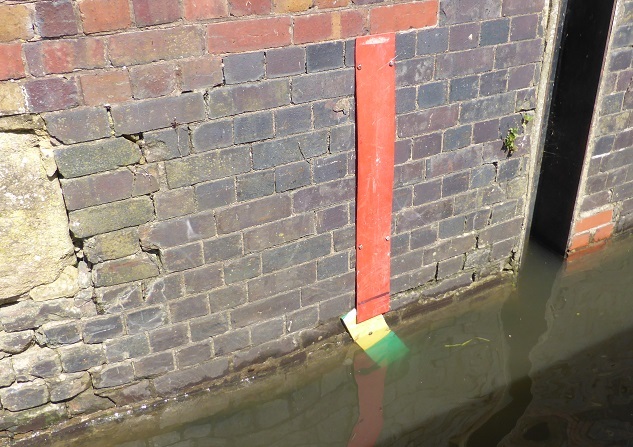 Which is why we’ve stopped in the canalised bits – just in case. 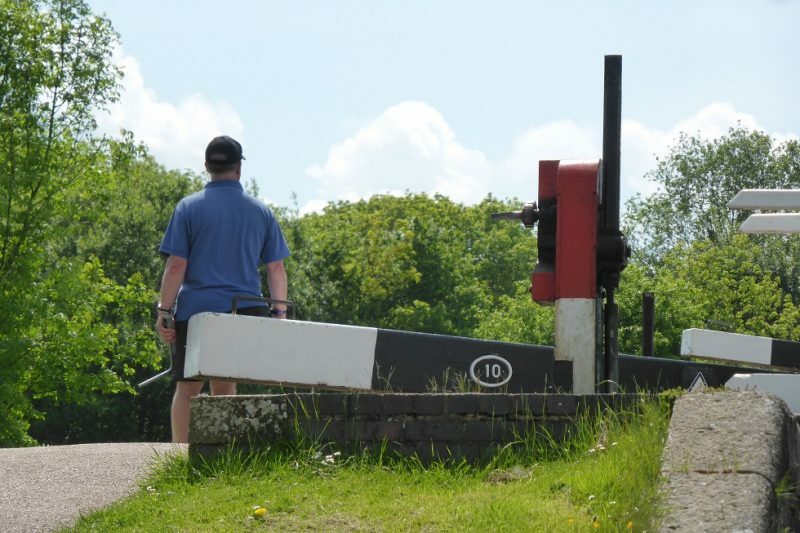 By now we had done the 10 miles and this was the last lock (no 6) before we moor up outside Watermead Park. The Soar having left us and we were on a bit of canal. 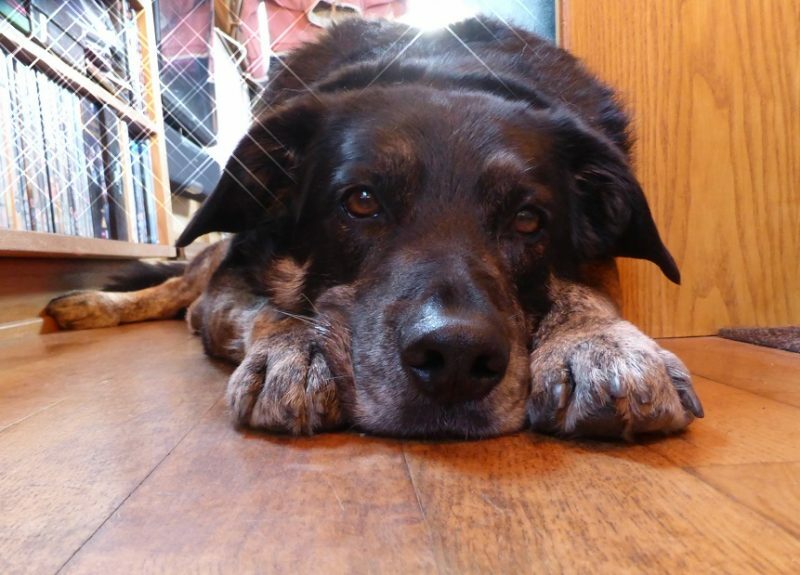 Quite a long day (for us) – over four hours! But we filled up with water (few and far between on this stretch) with one of the slowest taps we know (outside the Hope & Anchor Hungry Horse pub)! But we had arrived – one of our, well, Toby’s favourite spots. We even drive up here from Yelvertoft (about an hour!) for a day trip, just so we can walk around the park and give Toby his beloved swim. 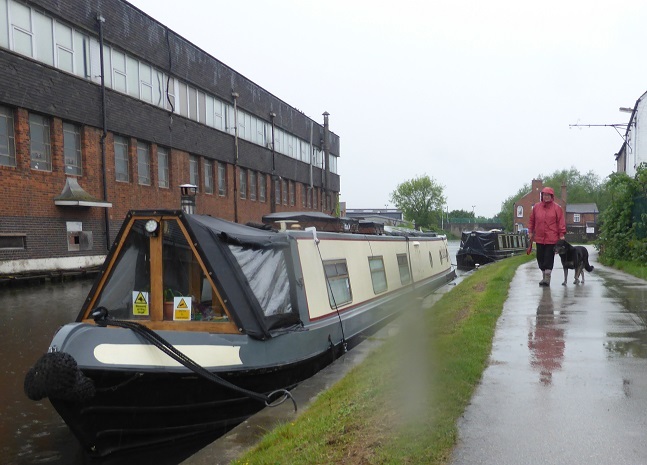 5 more locks and 5 more miles to get to Leicester – let’s hope for not much in the way of rain. Oooh – let a few days slip by! Last post was Saturday, tis a very wet Wednesday and so we must be in Loughborough! Third visit here and we always plan to be here in the rain! 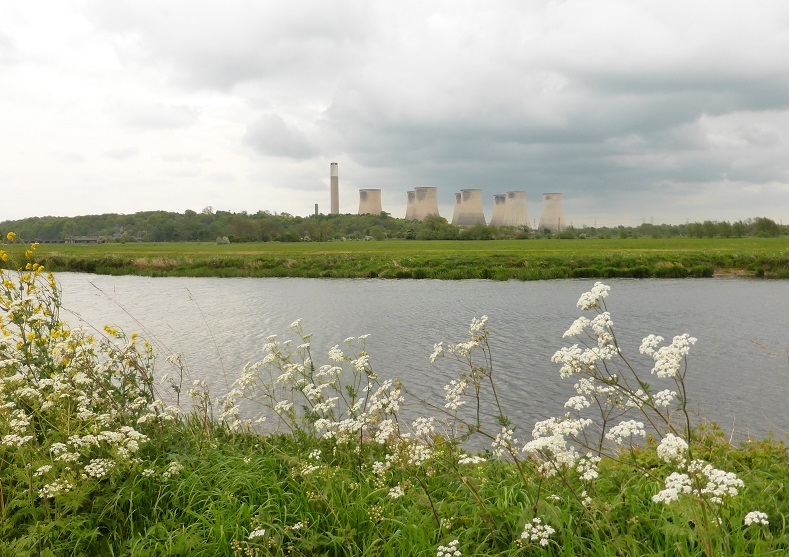 One reason is to avoid being caught on the river Soar which can rise in level & flow pdq. 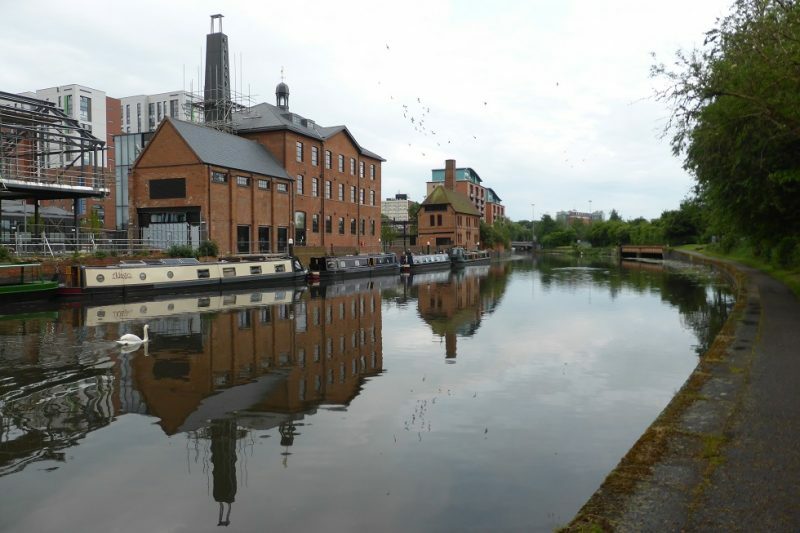 The town is on a canalised section and is a lot safer and quite a decent place for shopping, beer, facilities and beer! 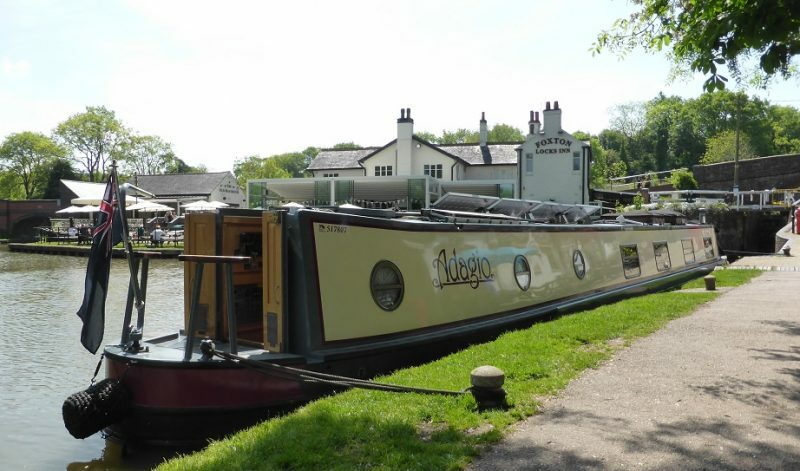 That blasted toilet hinge didn’t arrive at the marina, when kind Kate tried to phone LeeSan, they informed us, rather belatedly that it was being shipped from the States and would take another week (or two) What?? If I’d ordered it from Jabsco it could have been here the next day, doh! Still, not the marina’s fault – they have been very good. So let’s slip and move on with our tour! 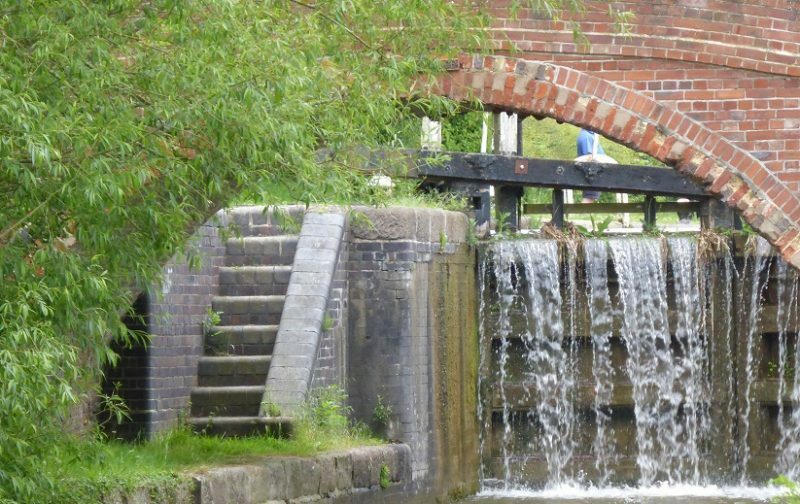 It’s through the locks and down the last bit of Trent and up the Soar! 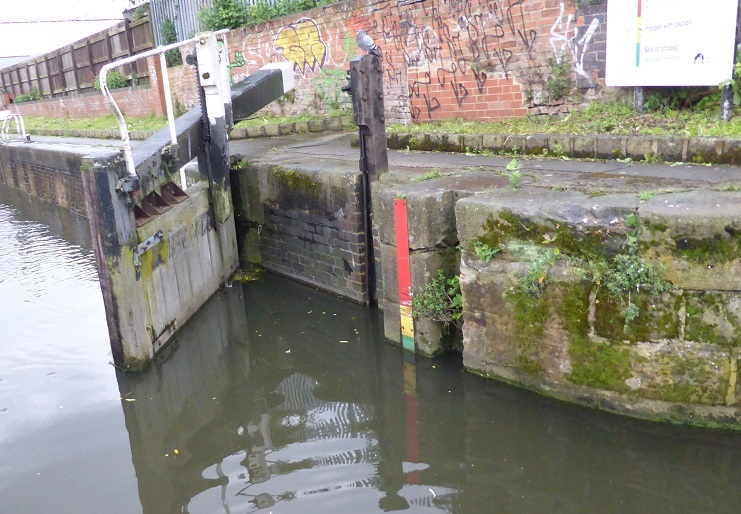 We’ve covered this stretch before (see blog passim – 2015) but here’s a rear view of the very deep Kegworth lock. Cruising the Cut, vlogger, David often takes videos of the nice houses (hi-ziz?) one comes across on the network – so here’s a gorgeous one at Kegworth. 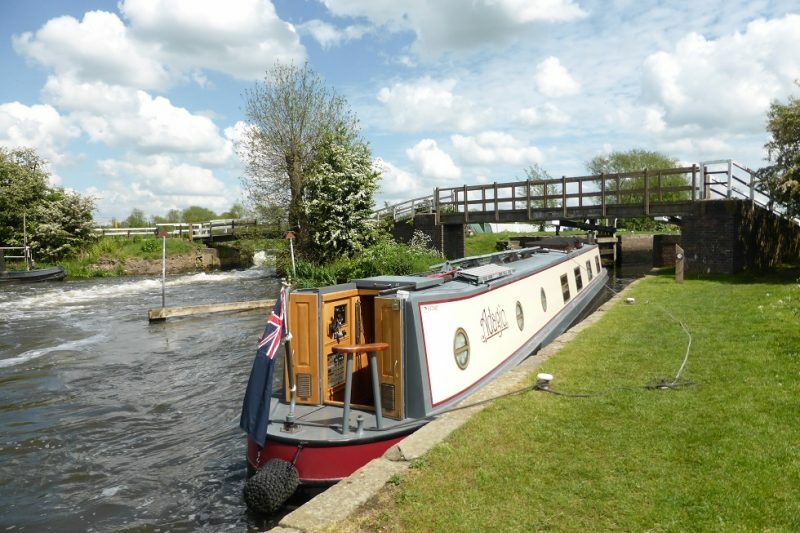 We reached Zouch and decided that was enough – it was very windy and so called it a day. Nice spot to walk the dog too. 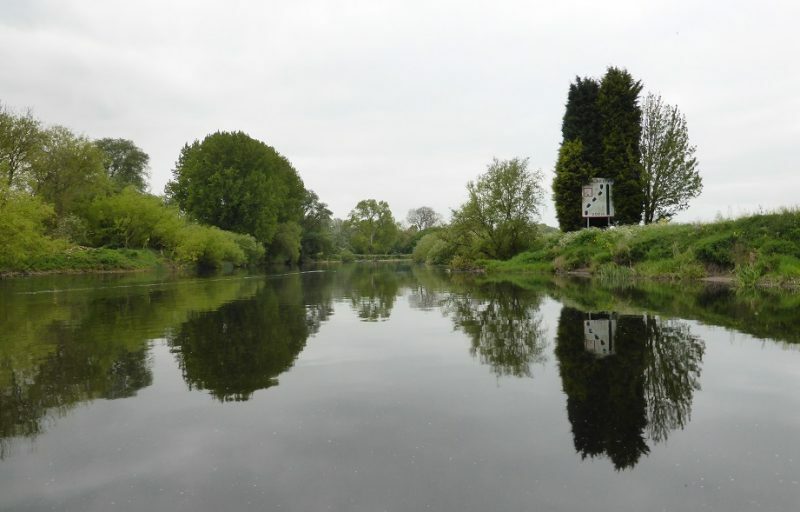 Tuesday we headed off early towards Loughborough – passing the Zouch weir: All calm now. We moored up outside what was, the Albion. Shame it has now past into history. Yes, it was an old-fashioned pub, out on a limb but it shut down in Nov 2015. 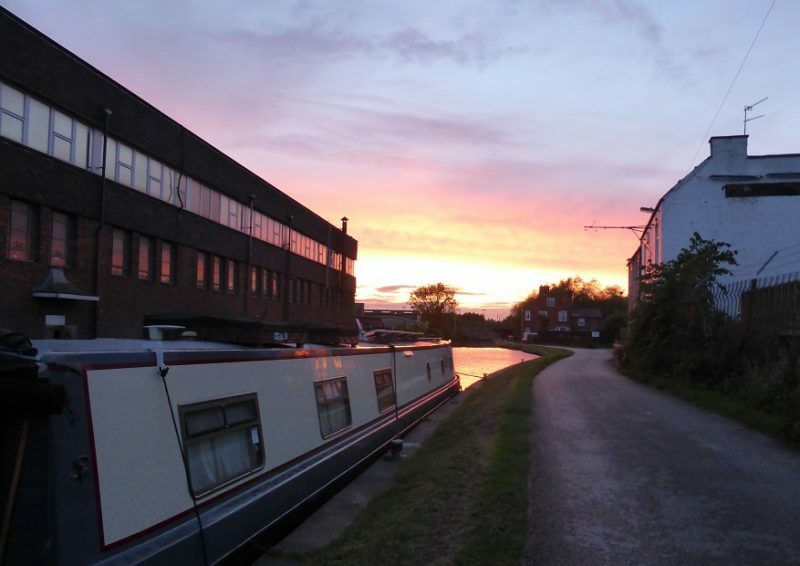 Still, it’s a quiet mooring spot and a gorgeous sunset. Wednesday was forecast to be wet and then some. 0900 to 2100, continuous wet. And lo, it came to pass. Viv went out shopping (and got wet). 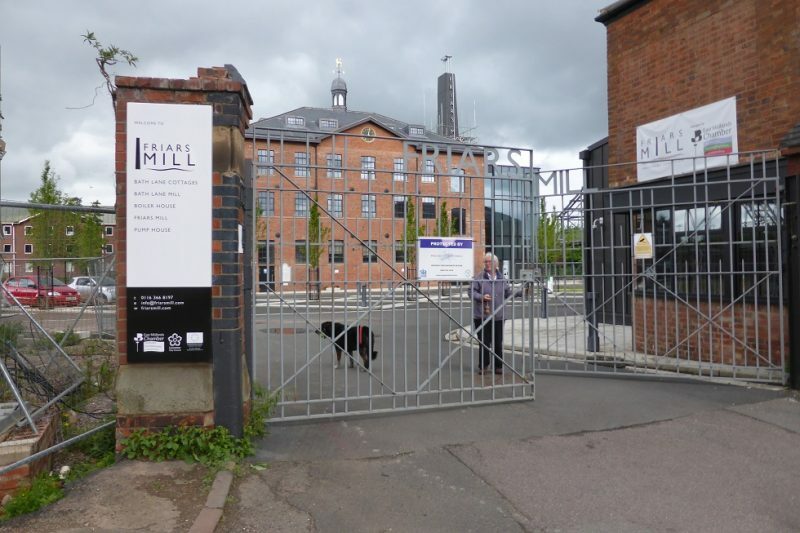 I cycled out to see the Grand Central Railway station and the Taylors bell foundry (still making bells). We then walked down to the end of the canalised bit we came thru to see the state of the river and yes, the red light was on! The level scale was only on the amber but I guess the levels would continue to rise. 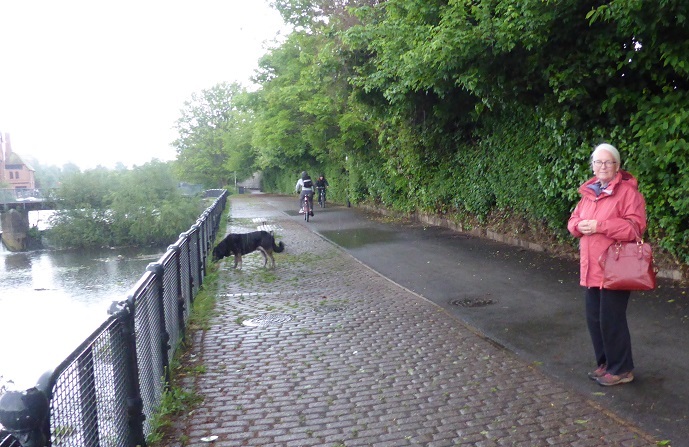 A very different day – wet! All togged up for the dog walk. 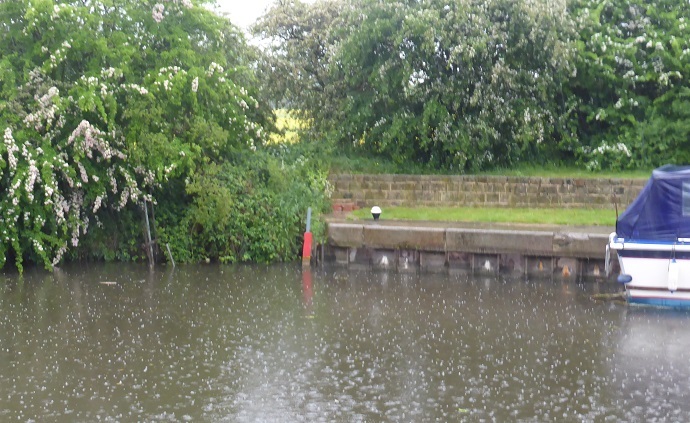 Down at the second lock (Meadow Lane), the red light was on!! 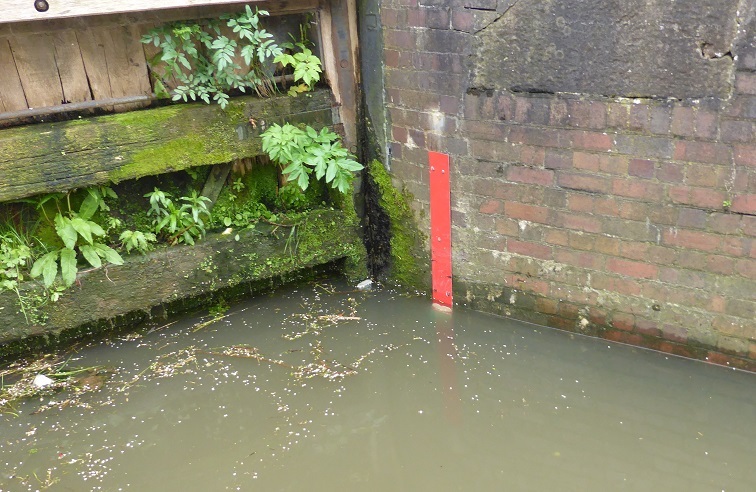 I’m guessing that CRT are being cautious but the level can only continue to rise, below the lock it was only registering just on the amber but it would be unwise to venture downstream. One animal was enjoying it all – Toby! Just after this bridge the Soar joins the canal exit and didn’t seem too much in a hurry. Just hope it subsides by tomorrow lunchtime when we plan to carry on up the Soar! 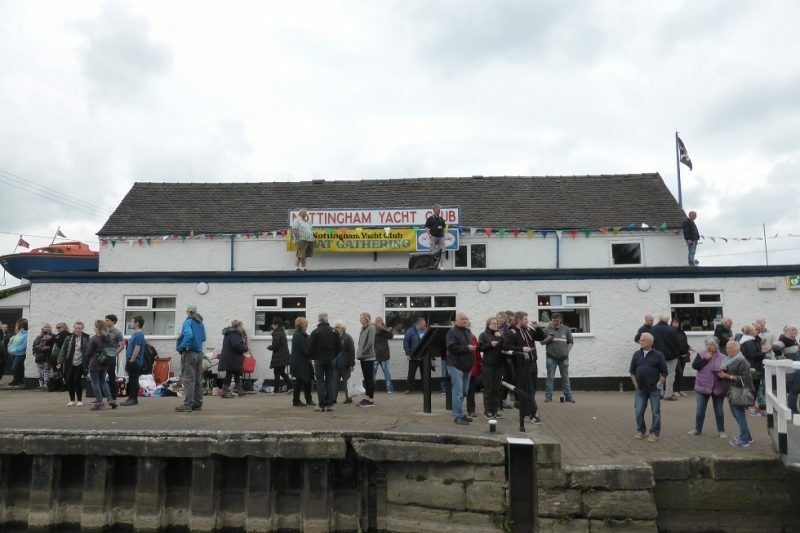 Today was the main event day of the Nottingham Yacht Club’s Summer “Do”. 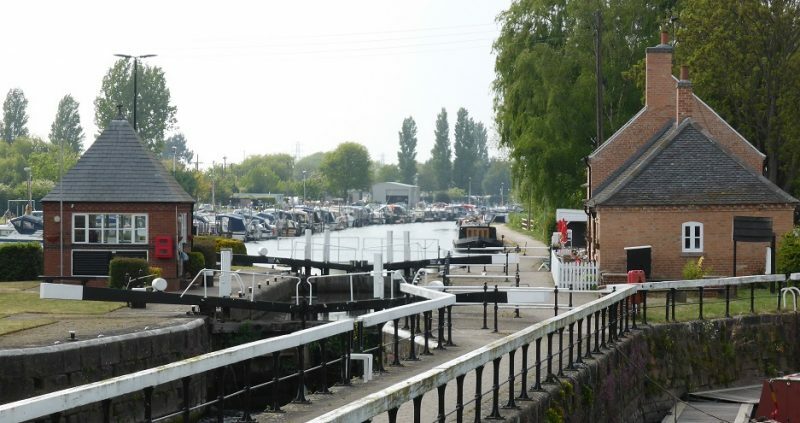 It’s about 40 minutes walk away, past Trent Lock and round to the end of Cranfleet Cut. They had quite a lot of stalls (welly wanging, plate smashing, toy goldfish in bags(?!) 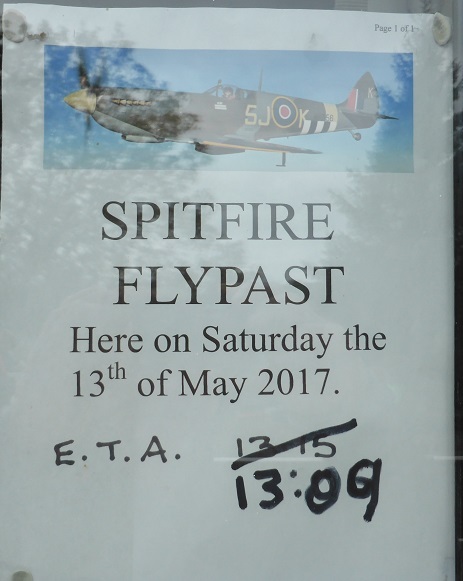 ), a brass band, beer and a Spitfire fly-past! I managed to capture some of it plus a dreadful video of the Spitfire not helped by the band, bless em! What do we do for power? 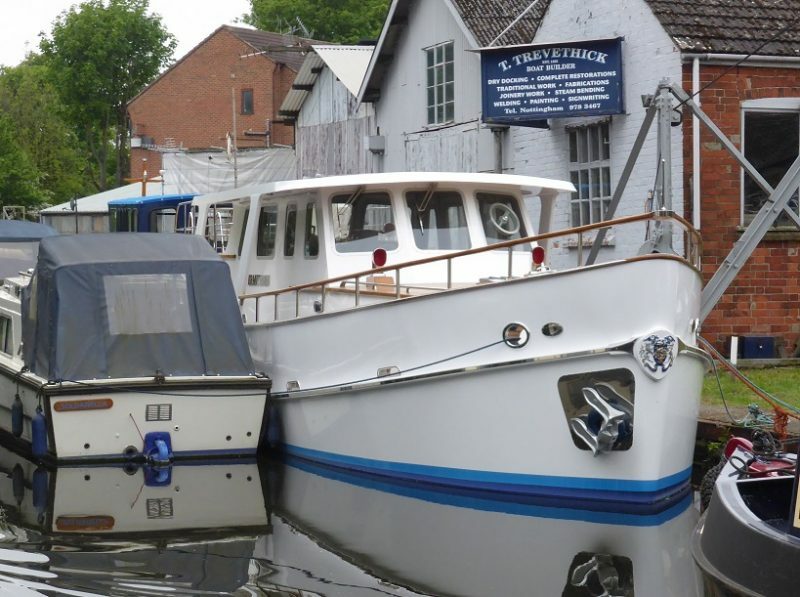 In the marina or with shore power supplied we basically have one power socket – imagine a home with one socket. Yep. Just one. We can draw 16 amps but you have to be careful what you plug in. Fortunately, most appliances are low power. I changed all the 31 light bulbs from halogens at 10 or 20 watts to LEDs at around 1 watt. The TV, laptops etc don’t consume much. The fridge is mains powered and at worst draws 8 amps but then not all the time, so let’s say 4 amps continuously. We have 600 ampere-hours of energy in the 3 AGM batteries and not wishing to go beyond 50% of their capacity, to prolong their life, we have 300 Ah to use. We usually get through 10% overnight or 20% if we watch lots of TV, DVDs etc. I don’t think it’s gone down below 60% ever. Once the engine is started, the a.c. alternator can give 3,500 watts back, so the battery charger, set to 90 amps makes short work of replacing any usage. However, if we stop for a few days or even a week . . . ? What then? We have a solar array of 4 x 100 watt panels and these at their very best will give about 25 amps. So they still will not recharge a heavy usage – imagine you need a 33% recharge – 33% of 600Ah is 200Ah, so with a reasonable 20 amps coming in it will take 10 hours. Possible but unlikely in our climate. All the panels do is keep us topped up enough to not have to start the engine, even after a week of sitting still. Luckily at this time of the year, the juice starts flowing quite early as the sun comes up. Higher powered appliances? Cookers, washing machines, toasters etc? On shore power no problem – as long as we remember to count up our total power (washing machine on heat, takes 1.8kW etc). With the engine running and at a fairly high revs, we can do the same, which is why we usually save up our washing, bread making, slo-pot cooking etc for when we’re underway. Washing: our slimline washing machine only uses kilowatt power for the heating stage, so we have taken to turning the heater off (a useful facility on the Ariston), just setting it to a cold wash but adding 10 litres of hot water from the tap. So we get a 40 degree wash but don’t use any kilowatts to heat the water. The few 100’s of watts the machine uses for turning the drum etc are easily supplied by solar and/or batteries. Neat tip there for liveaboards! Cooking: we use the gas hob for 99% of all cooking, using a big ceramic coated frying pan with a lid to do almost everything. A 13kg bottle of gas seems to last 6 months or more. If we run the central heating and we do in these not-quite-Summer mornings, it will eat up about 0.5 kg a day. So then a bottle will last for a month. Not bad and no need to service it (ever) and no nasty pollutants either plus it’s so quiet. We do use a bread machine and again this only takes power when heating up at the end, the last 52 minutes and then only 600 watts, so we plan for the engine to be on then. Ditto with the slo-pot, this uses up to 800 watts but only in an on/off cycle. Again a vital piece of cookware as we can do whole joints in 6 to 8 hours and they are so tender. I borrowed the power meter from our old house and clamped it to the a.c. output of the Victron. So we now have a display in the main cabin of how much a.c. power we are consuming – just a check to make sure nothing has been left on. 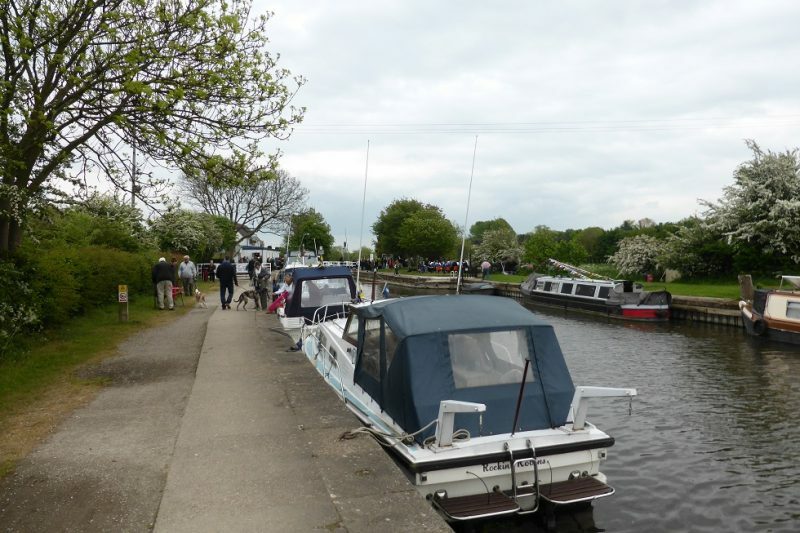 Still moored at Sawley Cut – we were planning to move on today but someone sat on the toilet seat & broke it! So a new hinge ordered (for yes, we are now officially unhinged!) 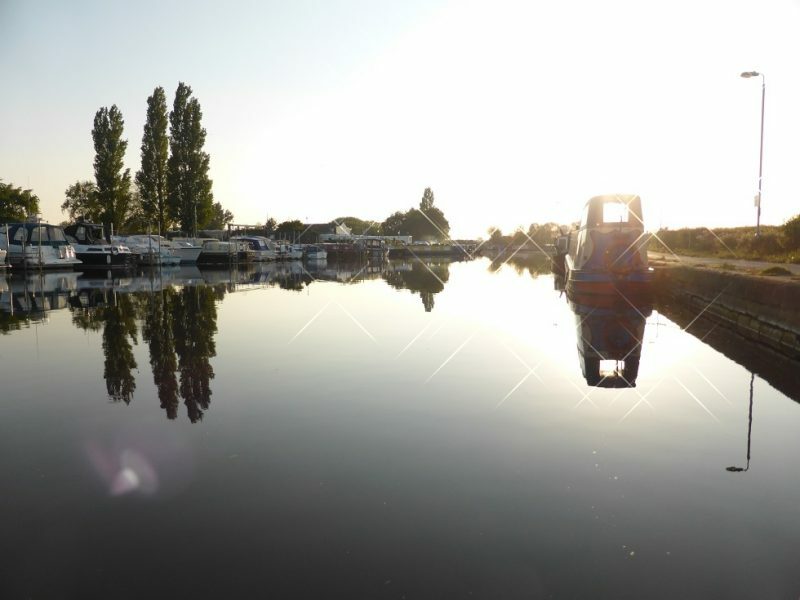 from Sawley Marina Chandlers – opposite. I phoned CRT to let them know and they were happy for us to stay a few more days. 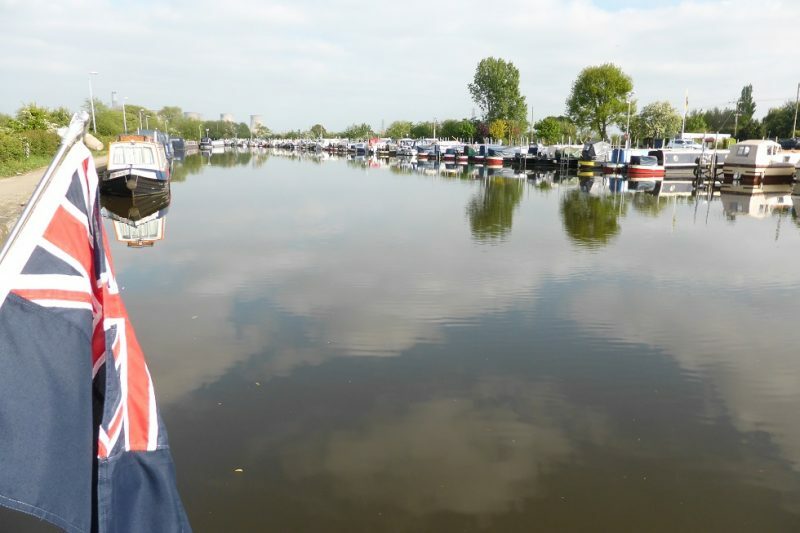 There’s enough space here for 20 boats, so we’re not hogging any spaces but they are labelled as 48 hr moorings. 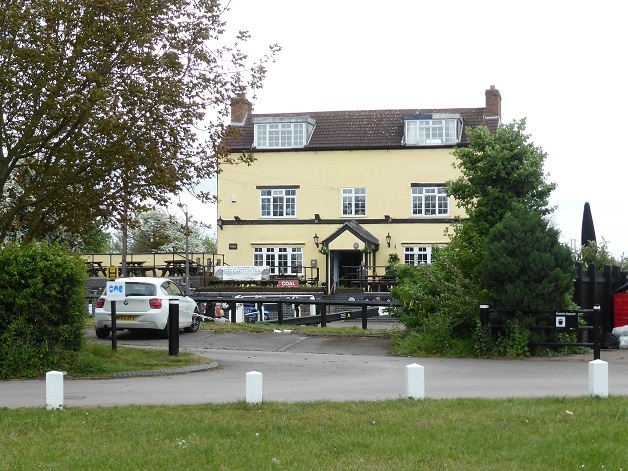 We walked to the Steamboat Inn yesterday – a great pub at Trent Lock – all their real ales (and they had 3) are £3 and the food is very good too. Despite our diet, we opted for their “Chip Cob” with extra bacon, cheese & coleslaw! Oink, indeed. 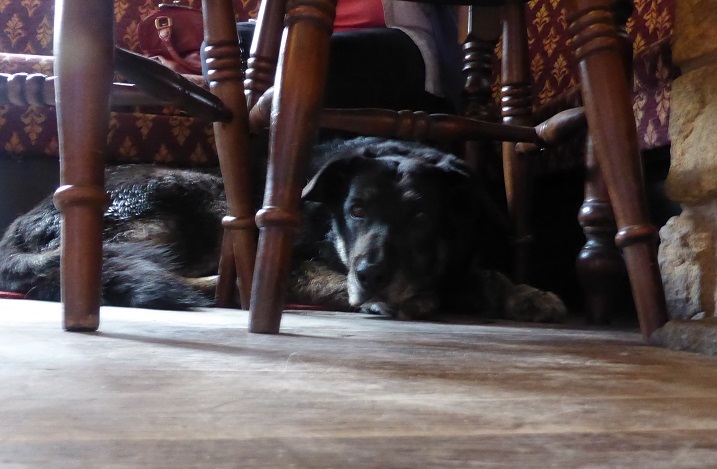 Toby took up his usual position but was fed copious quantities of dog biscuits by the bar person. Is Toby enjoying the trip? Only when we stop . . . The Steamboat has lots of “sayings” written on the walls . . . 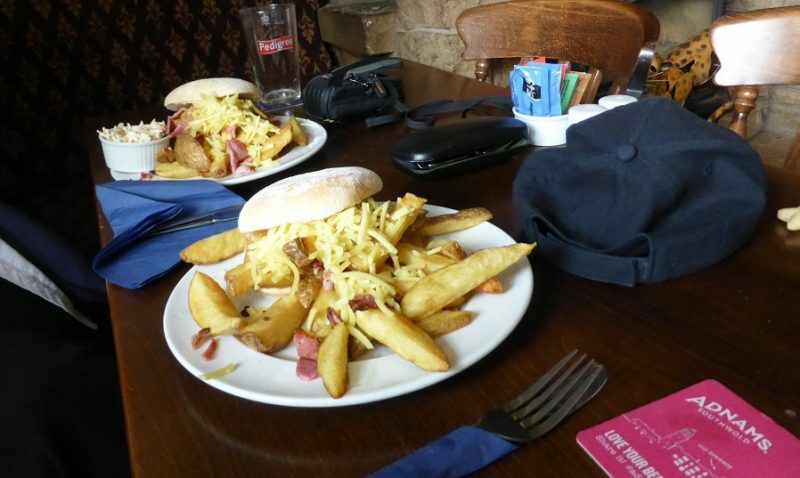 Bit of a wait for the food so we had a pint or two of Lancer and a new Wheat beer, here’s their famous chip cobs, 1 of our five a day, if you include the pot of coleslaw!! 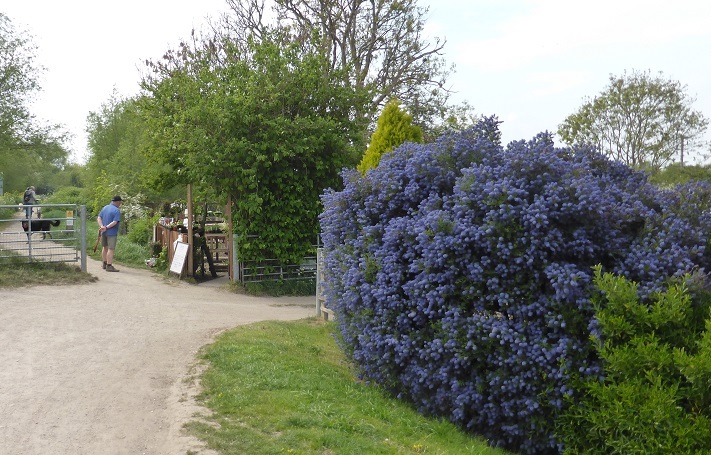 Toby knows the routine now . . . .
It’s a pleasant 20 minute walk back to Sawley Cut – passing a golf course and this lovely Ceanothus and look, Steven in shorts!! 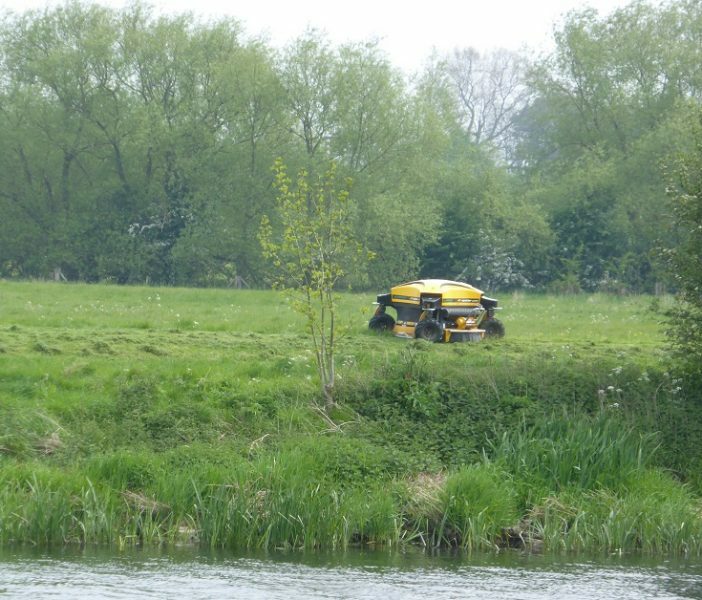 On the opposite bank of the Trent we saw two gentlemen not walking a dog but their drone lawnmower – neat! 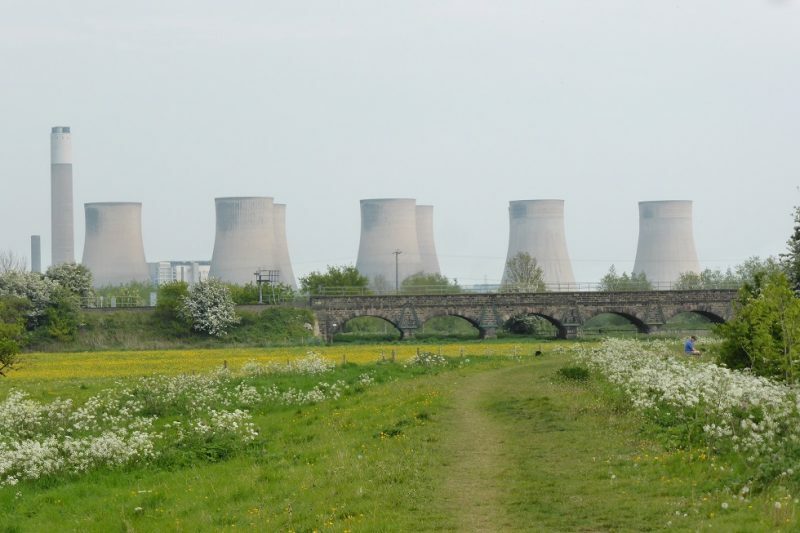 David (of Cruising the Cut fame) found these industrial landmarks quite charming. I guess they do have a presence. (Spot the Steve). Back at the Sawley locks. 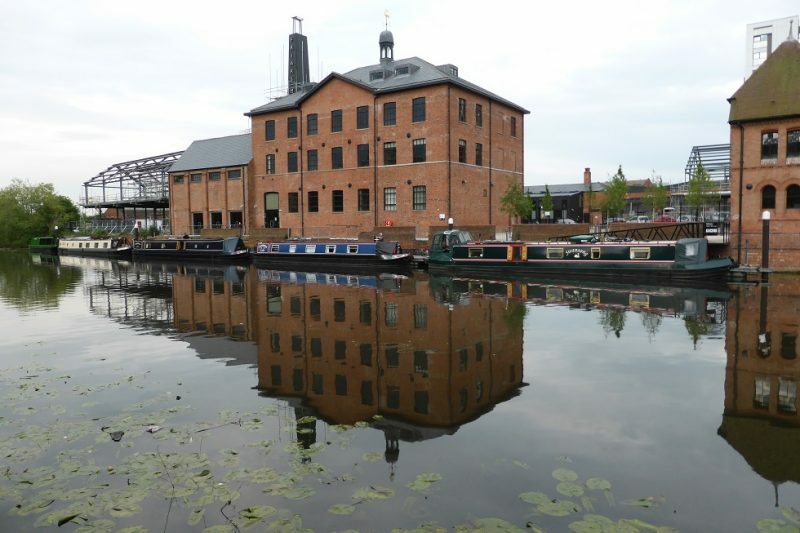 The building on the left is to be the Lock keeper’s rest, micro pub . . opening . . . later in May. 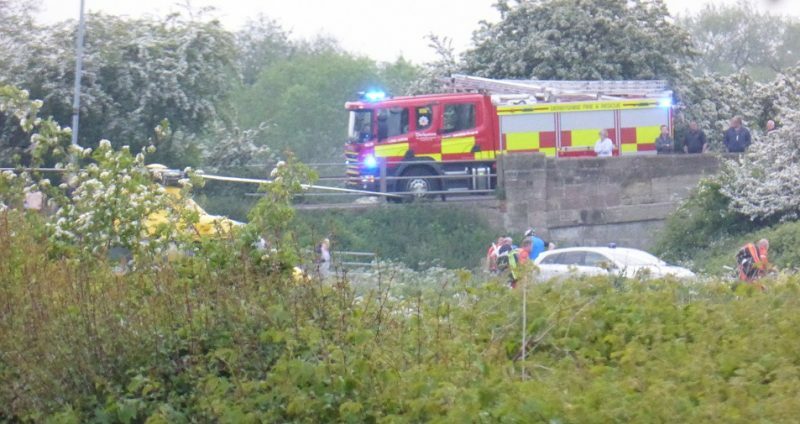 Some local drama that evening as a guy (so I’m told the next day) jumped off the bridge into the Trent. Police, ambulances, fire engines and the air ambulance helicopter turned up! He was successfully revived I’m glad to report. Meanwhile, next morning and it’s drizzling – a quite different picture from the earlier post but it does show that we’re not hogging any moorings! What to do with a day that rains later . . . make more trifle, yea! 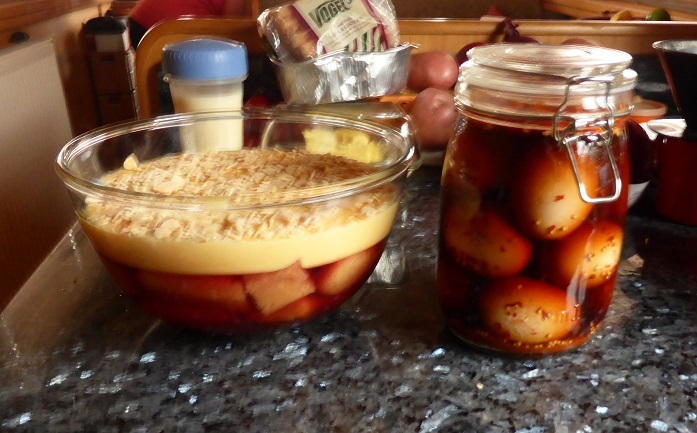 This time Viv has excelled herself – proper sherry trifle with sponges soaked, nay inundated with sherry then two jellies (pineapple and blackcurrant) plus custard and toasted almonds on top. Steve also had a go at making more pickled eggs. 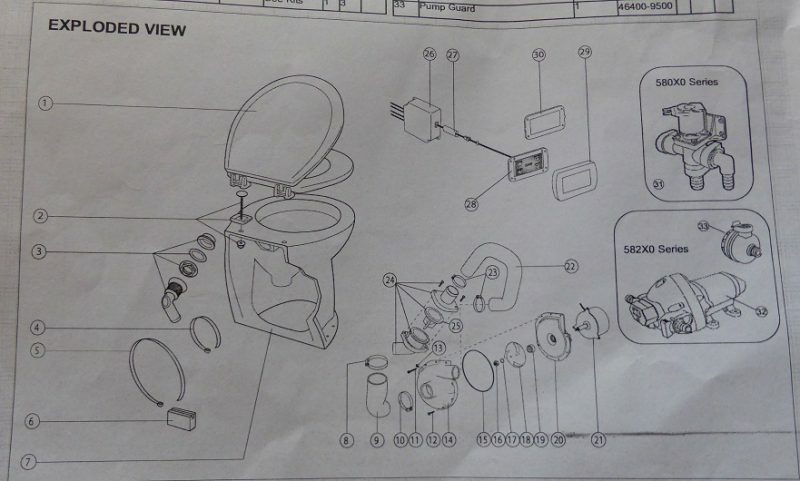 And now as Spike Milligan might have said, for the exploding toilet . . . .
We just need parts (2). Despite inching our way into Summer, it is only May and it has been decidedly nippy. The gas central heating has come on each morning (it has a set back temperature of about 14 degrees!) but it was time to leave Nottingham. I must also leave my Victor Meldrew hat behind as I keep on ranting about the state of the network/permie boaters stuck on visitor moorings/poor facilities etc “don’t get me started!”. 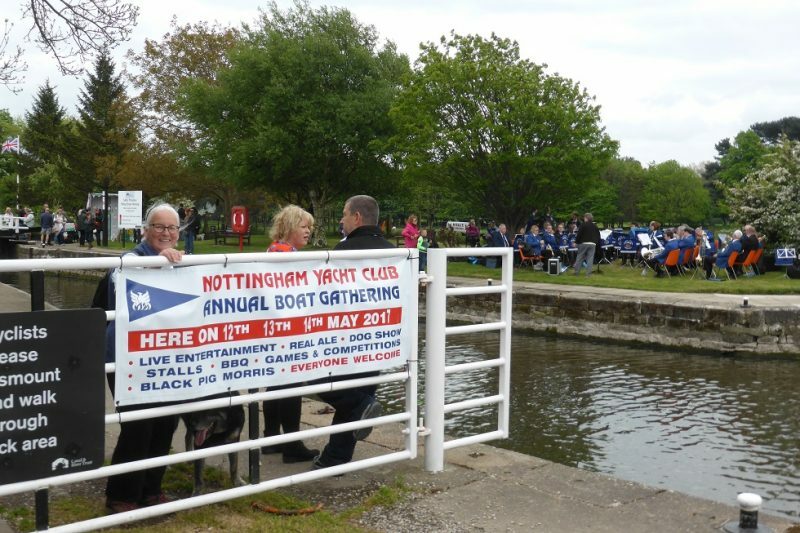 Nottingham City Council could also “do better” as it is not very welcoming to boaters. 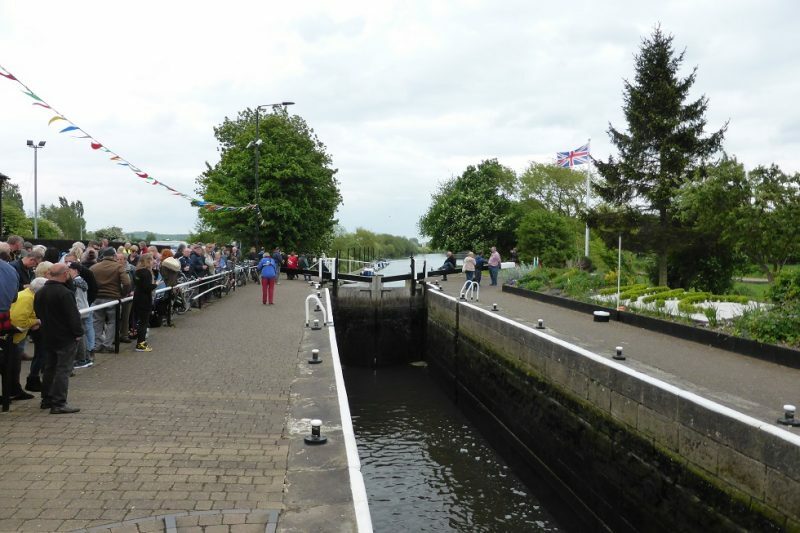 There are no water points between the start and finish of the canal, no refuse points, toilets or showers. The one at the ends are also out of use. And as Viv’s just reminded me, no poo bins for the dogs!! Time to move on. 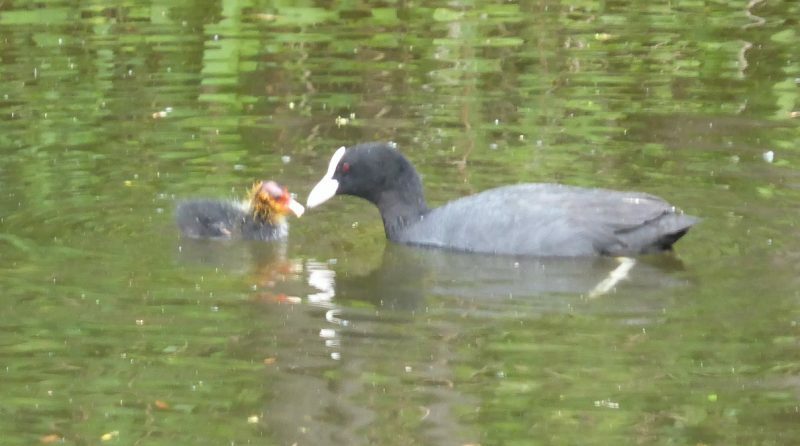 Here’s one of Viv’s nature pix – coot and baby coot! 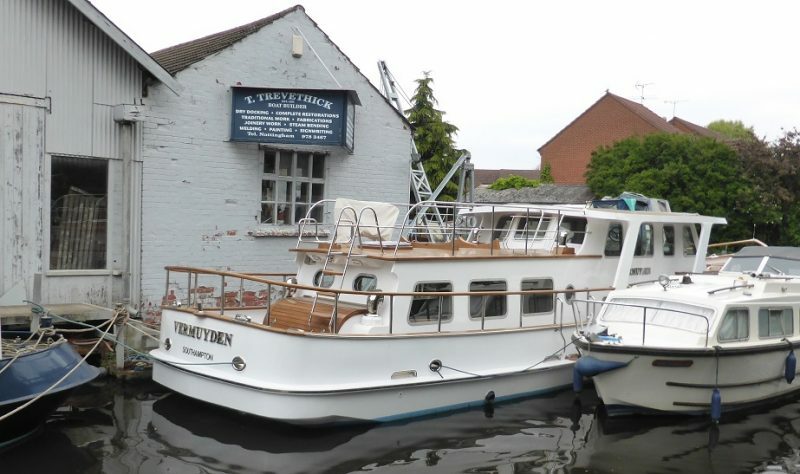 An old boat yard with the same boat that’s being fitted out (for years) – would suit my brother Chris? 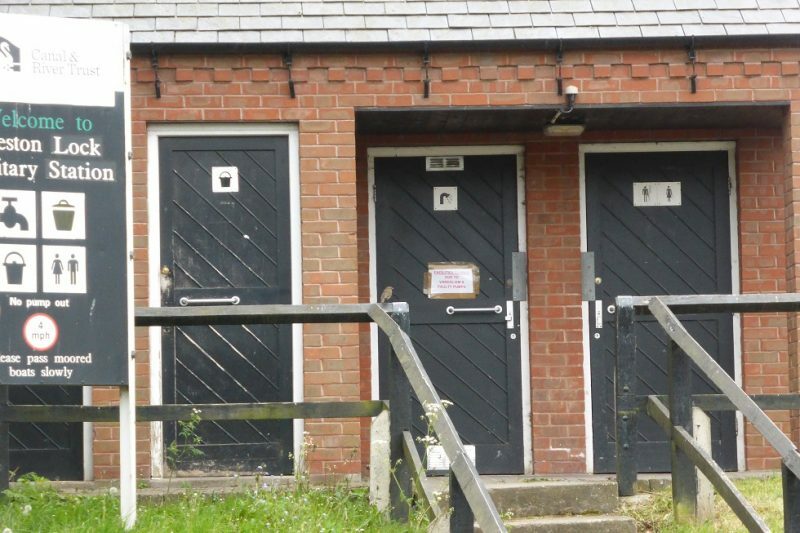 Ah, those facilities at Beeston . 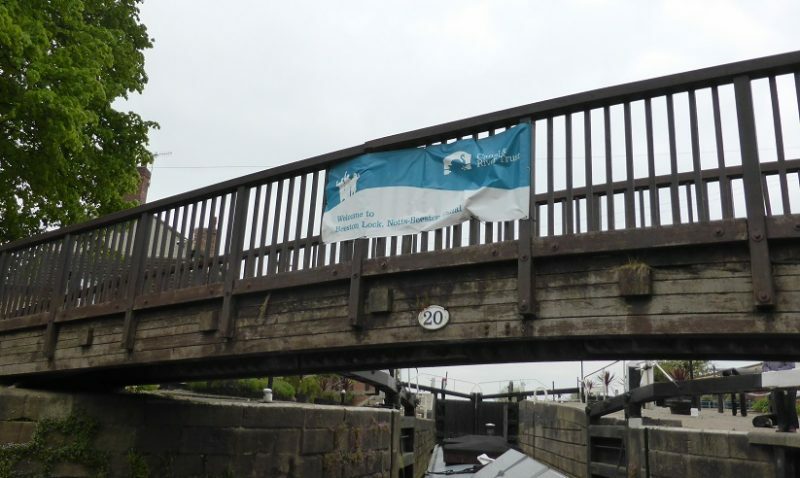 . .
CRT seem to want to spend £1,000’s on banners rather than keeping the system working! 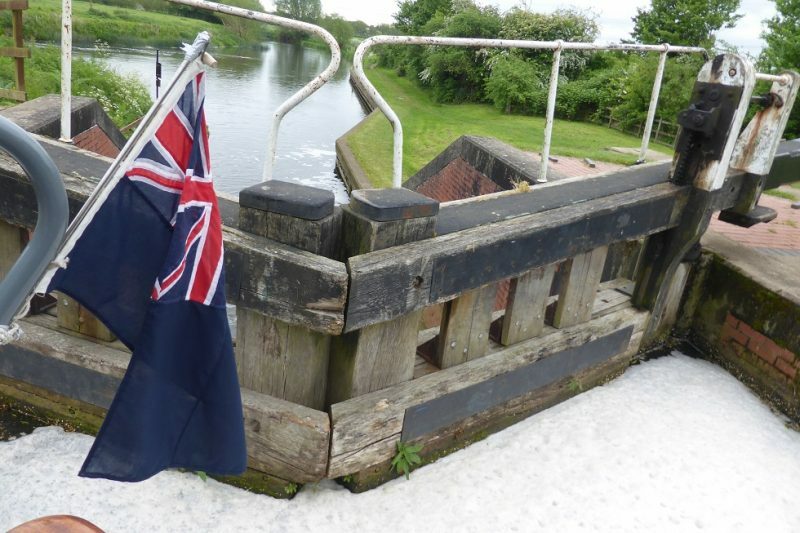 This is Beeston lock – out on to the Trent – levels are very low. The drop here is only a foot – can be five feet! 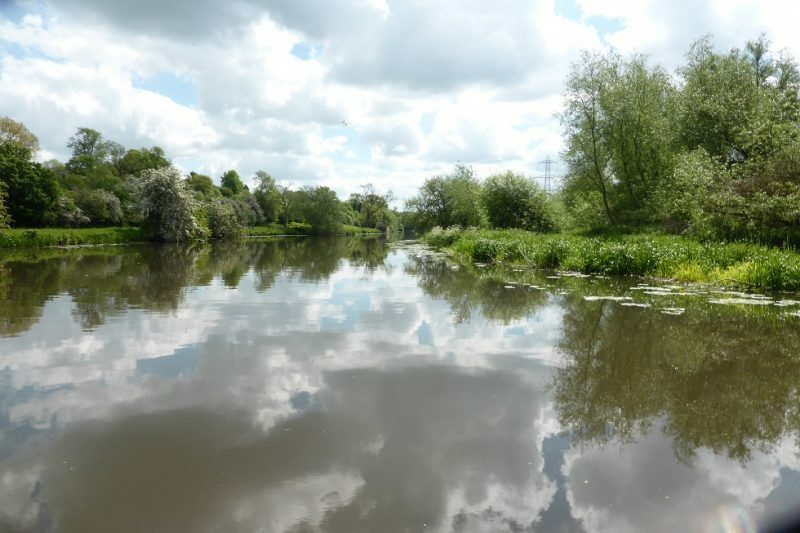 As you can see all very tranquil, hardly any sign of a flow and no wind thank goodness. 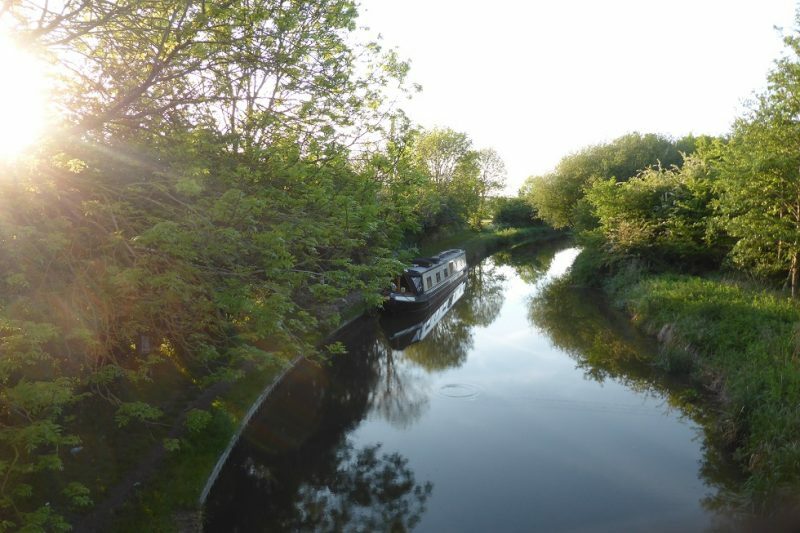 Rather than re-join the Leicester Ring loop, we’re now at the top, map-wise, we backtracked to Sawley Cut – a nice mooring, hopefully to visit the new micro-pub right by the lock but alas, Dave the owner is still waiting for racking kit to arrive and it looks like a week’s delay. Oh, well we’re only an hour away by car from our marina so we’ll be back. 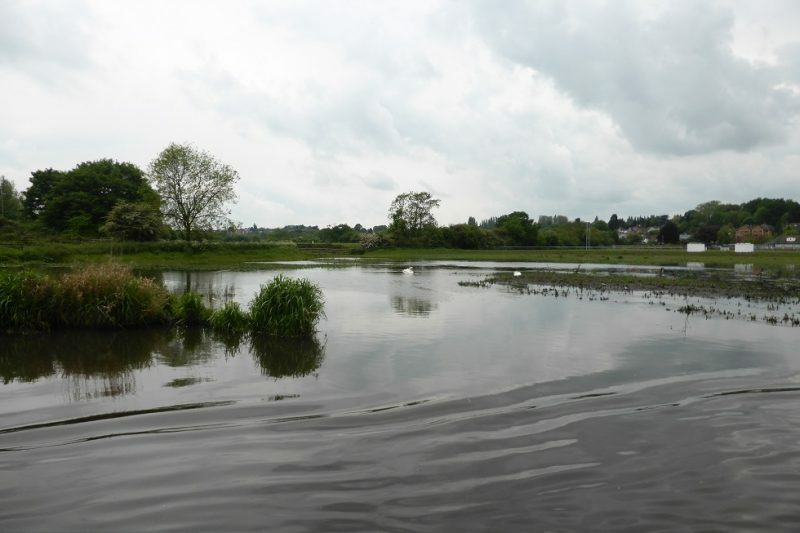 Meanwhile here’s a “View From” photo looking back towards the lock, with the Derby Motor Boat Club on the right. And from the bow at sunset . . .